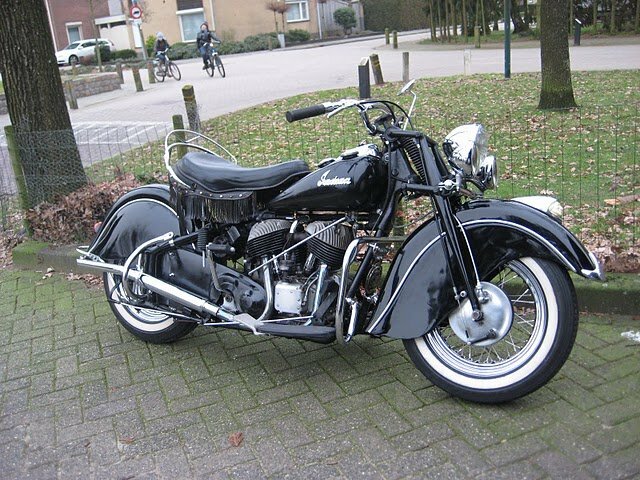 Indian Parts Europe - New Parts (+ Advice, Help ? 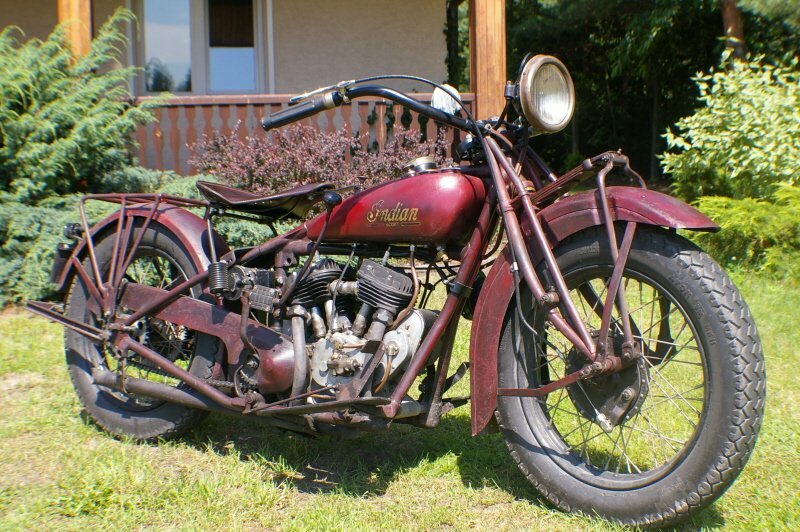 Consulting) for Old Indian Motorcycles! 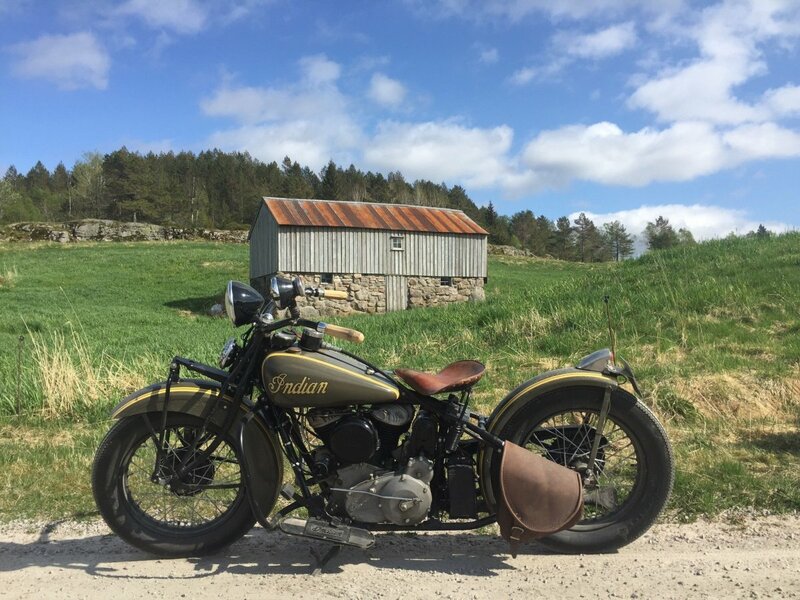 Worldwide Mail Order - Quality Parts - Special IPE Stuff - Engine Work - Advice/Help with your Indian Project If you need something but don't see it - or if you're not sure what you need - just email me and we will figure it out. Update September 2018: Production of King clutch kits has ended, but IPE still has your clutch needs covered! 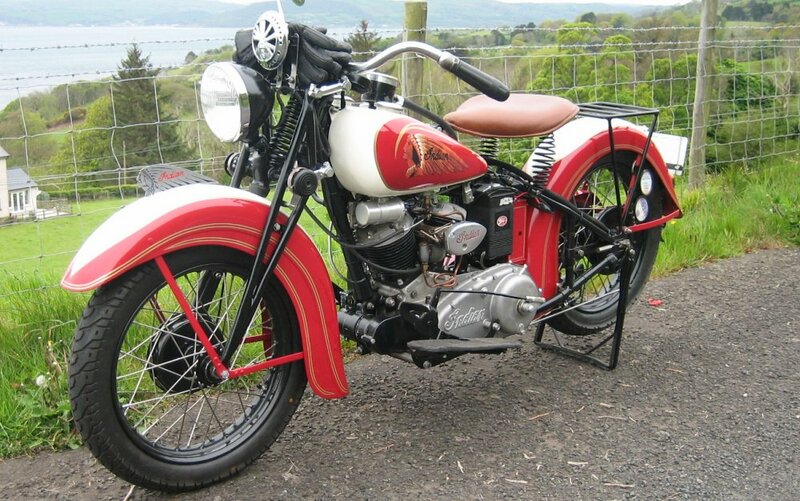 Note that some prices on the website are out of date, some parts no longer available, and hundreds of parts that are available not being on the website. 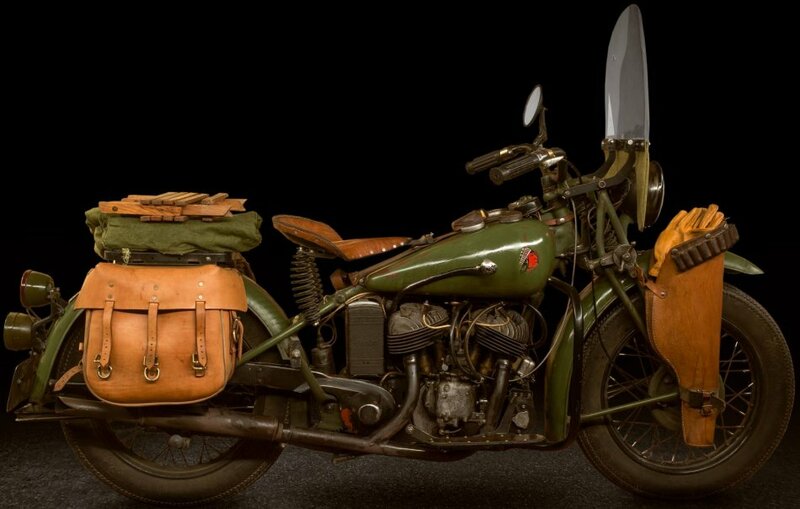 Basically, I have just about everything you will ever need for your 741 or postwar Chief, some parts for earlier models, and a number of special parts not available anywhere else. I am thinking about what direction to take the website, to better represent how IPE has developed over the last years, but so far I don't have the solution. Most of my time goes on email from old and new customers, and I am not sure when I can find the time for a major website update. But I will start adding some minor ones from time to time - just so people don't wonder if I am still alive! One of the things I would really like to do is more technical writing. We will see. ASK if you need something you don't see here, or if you are not sure what you need. Also, do not hesitate to ask if you have any questions about the care and feeding of your Indian. Something else; I don't have a smartphone or tablet. If anything here looks odd on modern devices like that, or is really slow to load, please let me know. I have a bunch more "friends & customers" photos to upload in the album below, but not sure if all these (and more) pix are a problem for those devices? Couldn't help posting this snapshot of freshly cast 741 CV manifolds! Still some time until they are ready, but in progress at least. 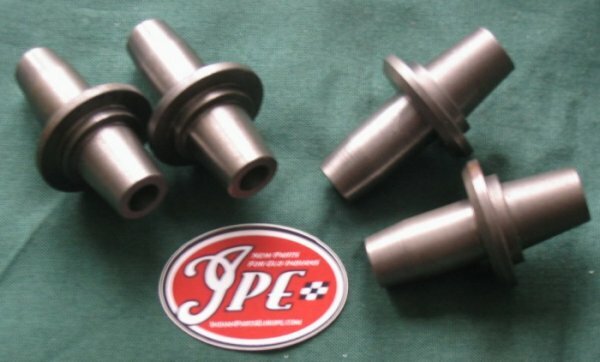 A small batch of manifolds for fitting Keihin CV carbs to 741s is in the works. This pic shows the sand mold and core - and I hope it illustrates how much work there is in even a relatively simple part like a manifold! The red sand is the mold, formed around the patterns on the 741 page. The grey sand is the core, formed in two halves in a core box. The core forms the hollow inside of the manifold. Note risers (where molten metal can rise when the mold is filled) and vents for gasses to escape through. 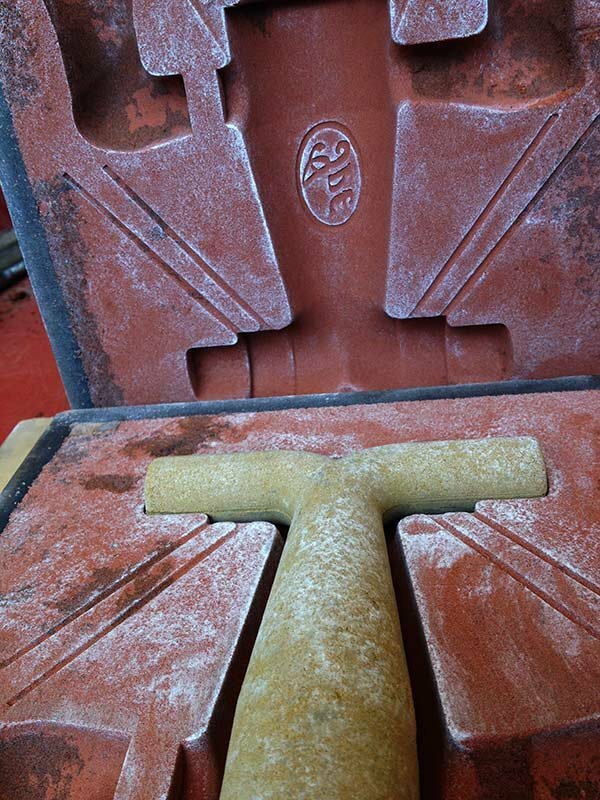 The manifold is formed when the molten aluminium fills the space between the red sand of the mold and the grey sand of the core. After the metal has cooled, the mold is broken apart (yes, new sand must be packed and dried for both mold and core for each manifold). Risers and vents are cut off the manifold, and the scars and casting flash cleaned up. Then the manifold has its ends turned in a lathe, and PEEK sealing cones are made to fit. 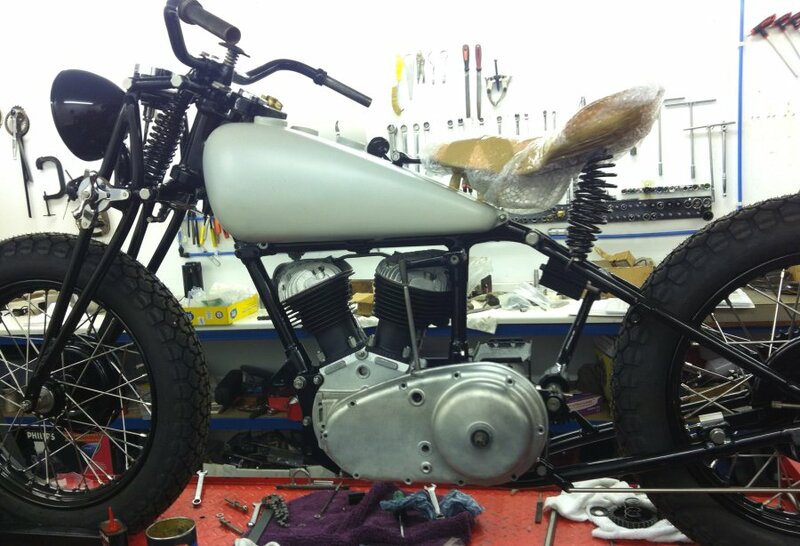 Finally it has nuts, rubber hose and clips fitted and gets posted to its eagerly waiting new owner. If you need one of these manifolds, don't leave it until the last minute. Only a few are made at a time, and sometimes it can be more than one year with none being made. Oh, and yes... theoretically, the big CV may be too big for a 741, but in real life it works really well. 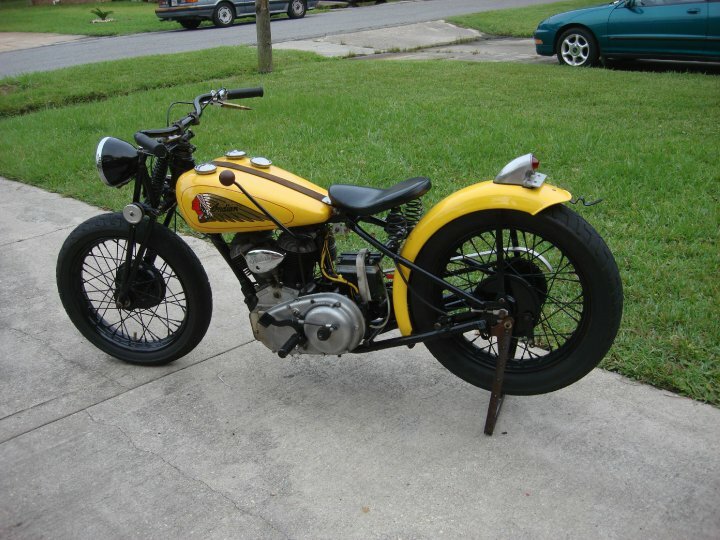 Kinda like a bumblebee! 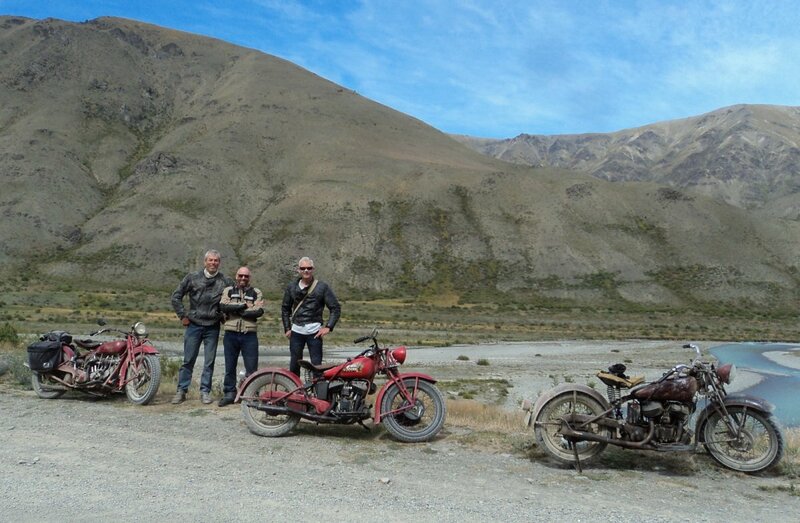 Speaking of 741s... Jon, Mark and Tim in the backblocks (NZ-speak for - well you can get an idea from the scenery here!) on their adventure bikes! 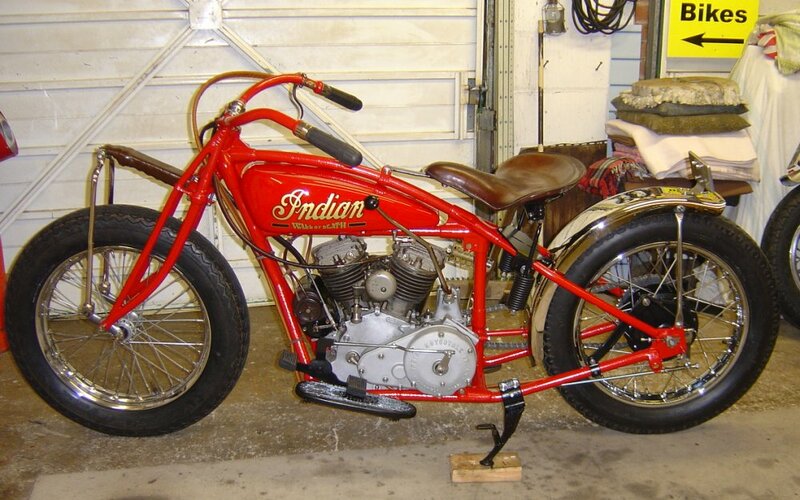 Indian Scouts are hardy little beasts and were made for this kind of riding. 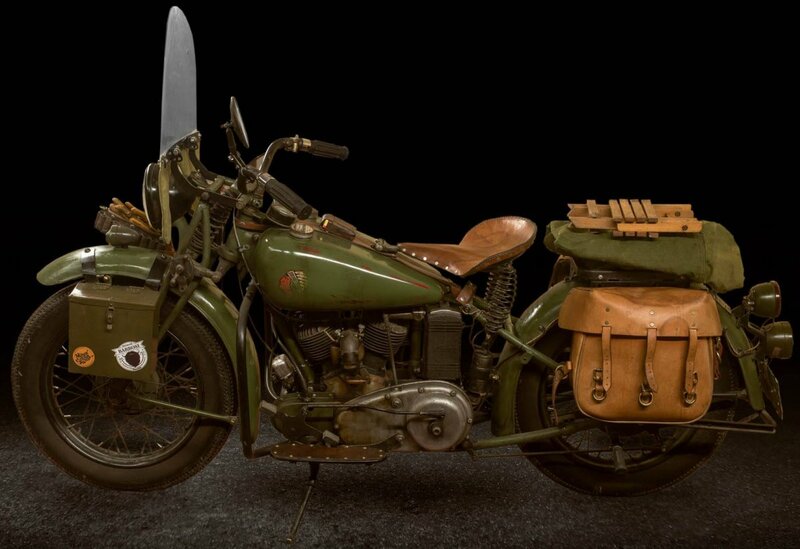 The 741 military bikes were obviously meant to deal with much worse going than this, but when the 101 was new - and much later, too - this is pretty much what a good road looked like in most parts of the world outside of cities. 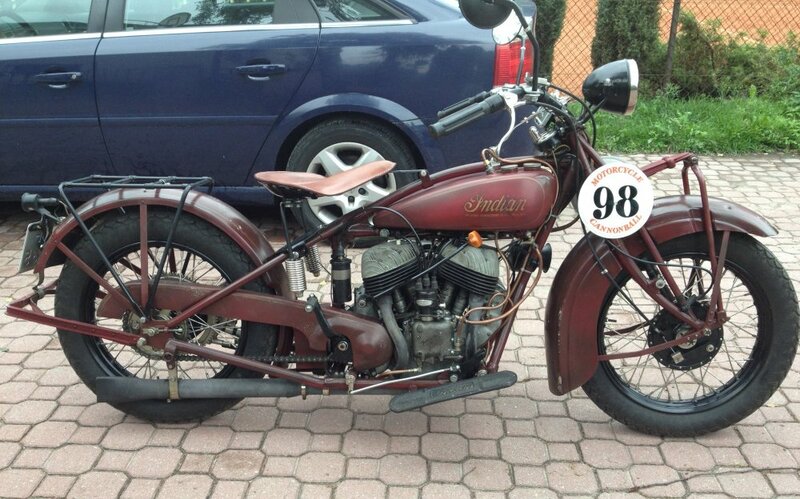 Indian Chief goes to Linkert Attacks! 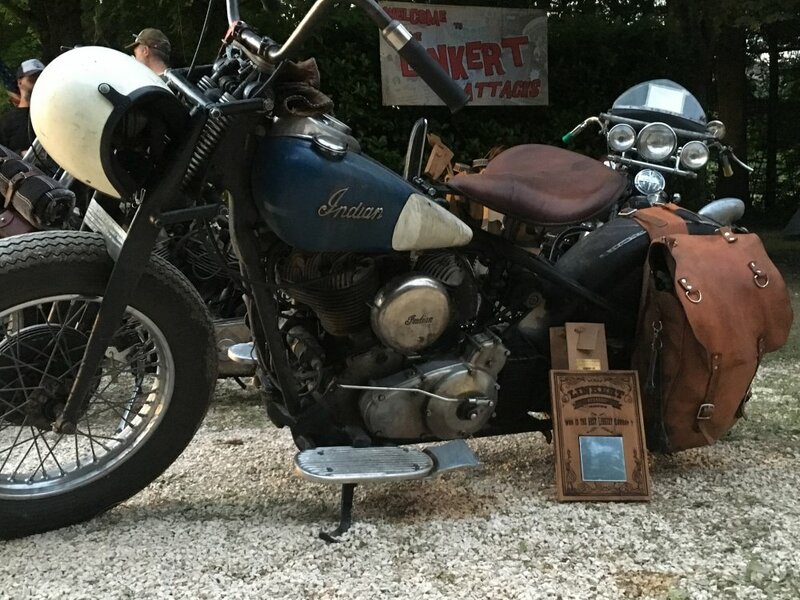 The Chief ran well all the way. The minor problems that came up were solved pretty quickly and without too much trouble. From Copenhagen, the road led over Kolding to Lübeck in Germany on Saturday. That is where I discovered that the bolt that holds the rear of the gearbox to the frame had lost its nut. 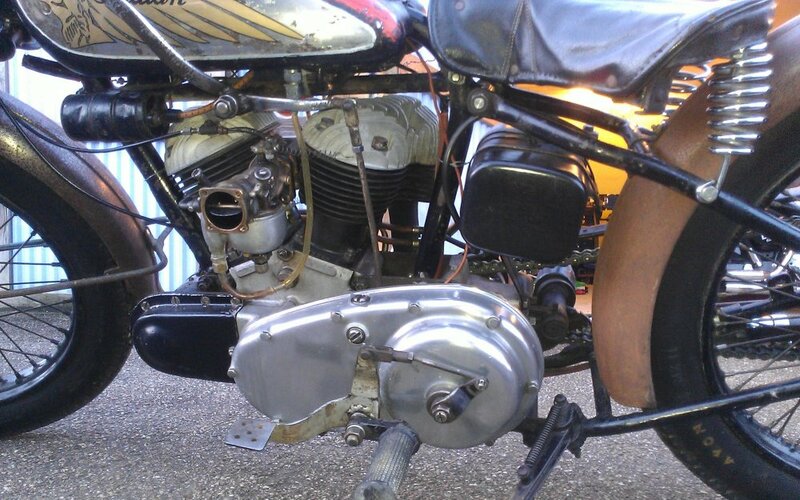 First it was repaired with the thin nut from the front brake anchor plate, but I got a new bolt and nut in L?beck. 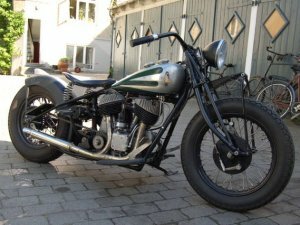 On Sunday, leaving Lübeck, there was a new rattle from the engine, and it turned out that the bolt holding the cylinder head steady to the frame was gone, and the spark plug cable tube loose. I stole a bolt from the generator bracket and tightened everything down with Loctite. 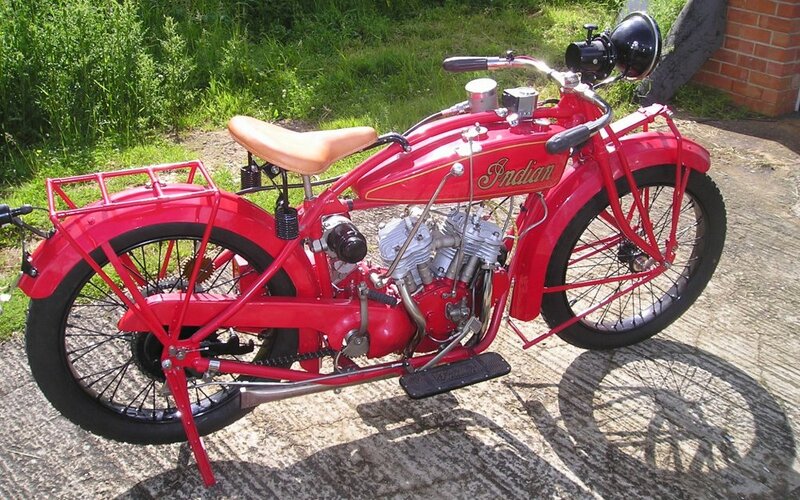 Luckily, Michael soon turned up on his Indian, with a spare bolt that fit the generator bracket. 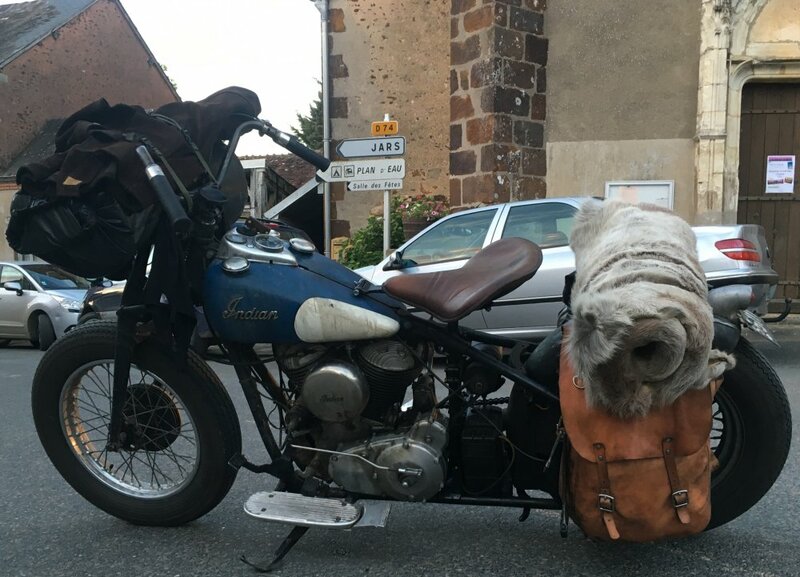 The next day we carried on through the Ardennes to France where I got a good deal of rain - and suddenly the Chief didn't really want to go... I started by checking that there was still oil in the gearbox and in the tank. 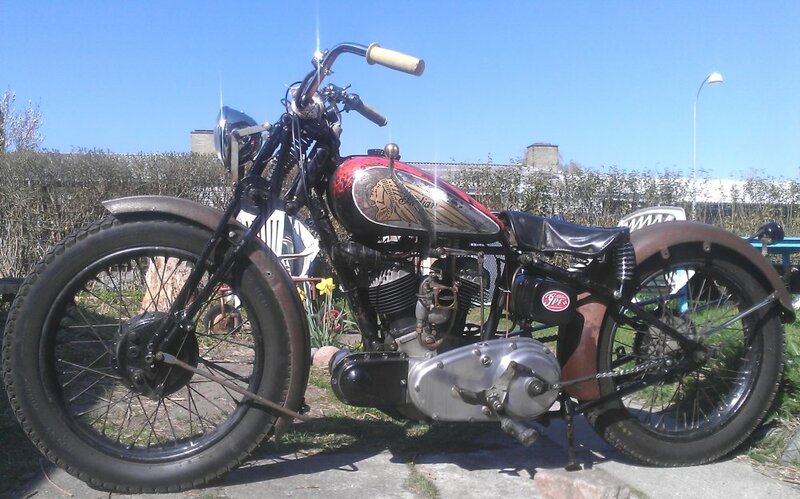 That was all good, so next I changed the spark plugs. That wasn't the problem, either. 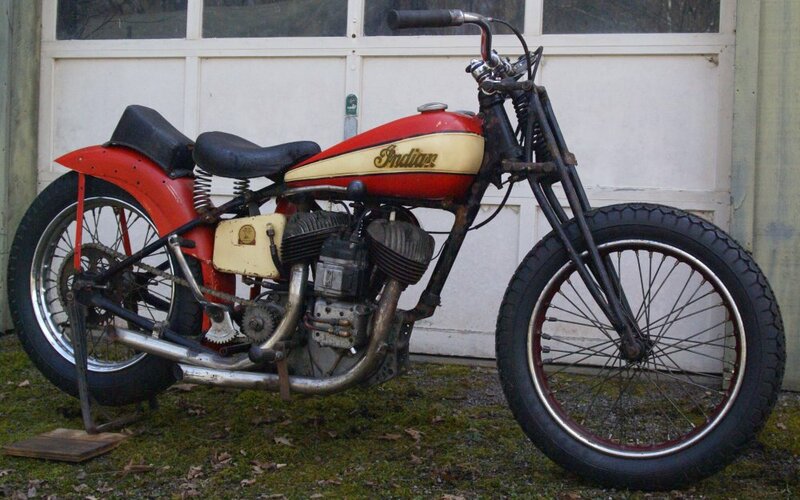 Rode on a little, engine missing and bucking. Stopped to check the distributor, and it turned out it was damp inside. 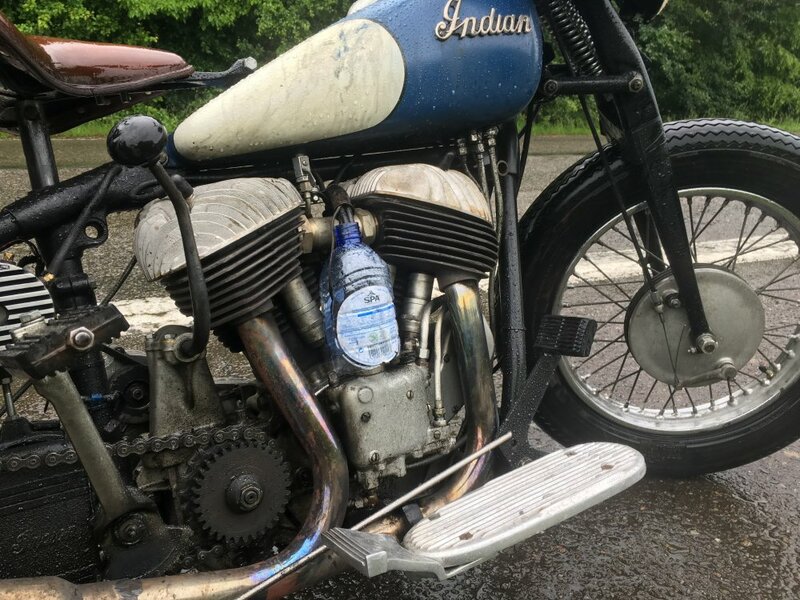 Not sure that was the real problem; cut up a plastic bottle to pull over the distributor anyway, to shield it a little from the rain. Rode on, still with the same problem until I had to stop again. 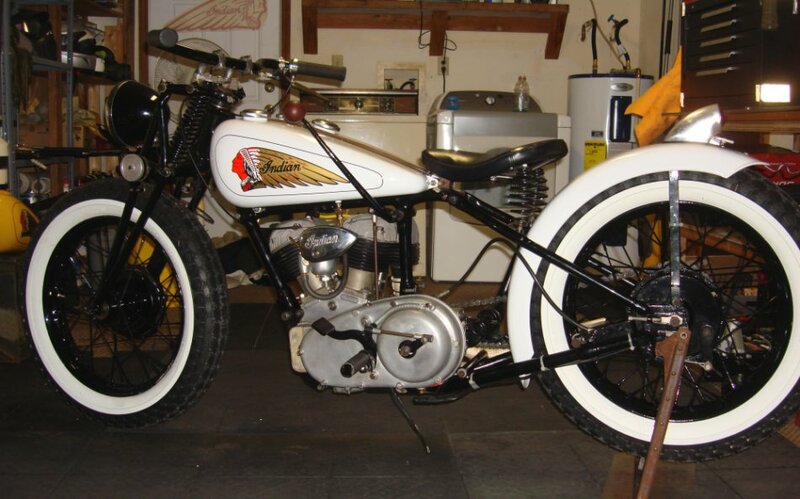 Came to think of J-O's (the owner of the white Chief in some of these photos, and further down the page) problem with rain water in the carb, so I took off the air cleaner and wrung a good deal of water out of the filter. Took off the filter and was able to go on as long as I didn't use too much throttle. Problem solved. 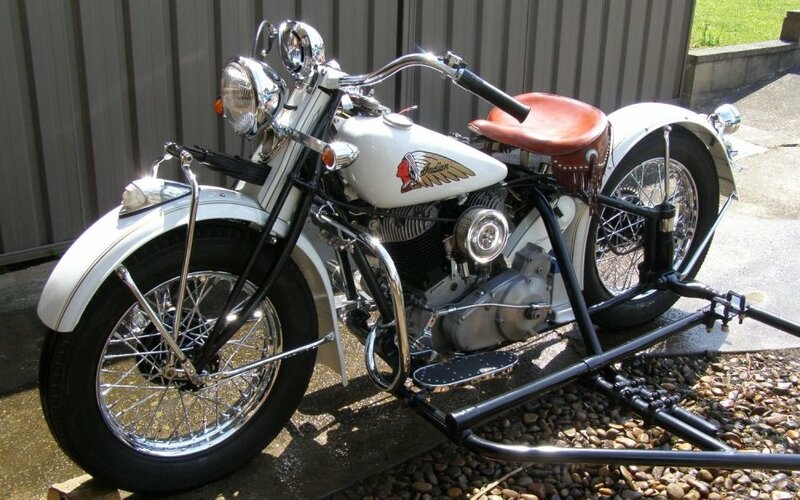 The conclusion must be that a front fender is a good idea when it rains! the "99% new" IPE Chief here. After that it was actually just straight ahead for a really long time... 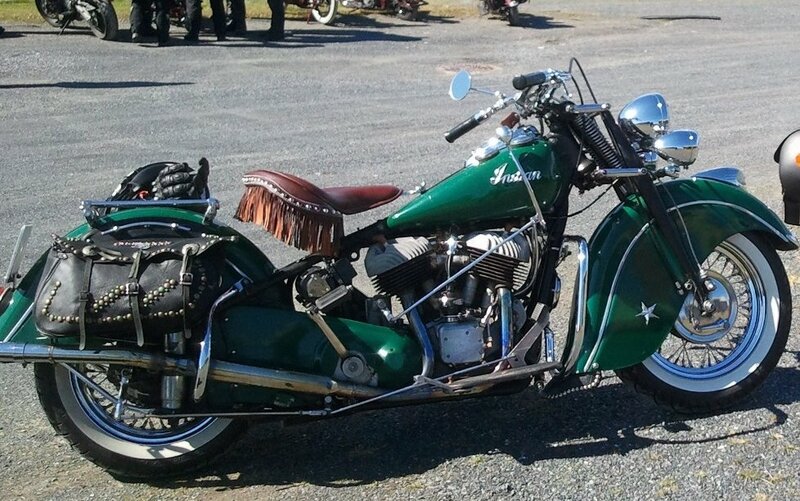 The Chief did use quite a bit of oil, but it was cruising at 105 Km/h (65mph) most of the time, and I understand from the Indian folks I met at the rally that it is normal for Chiefs to use some oil at "high" speeds. 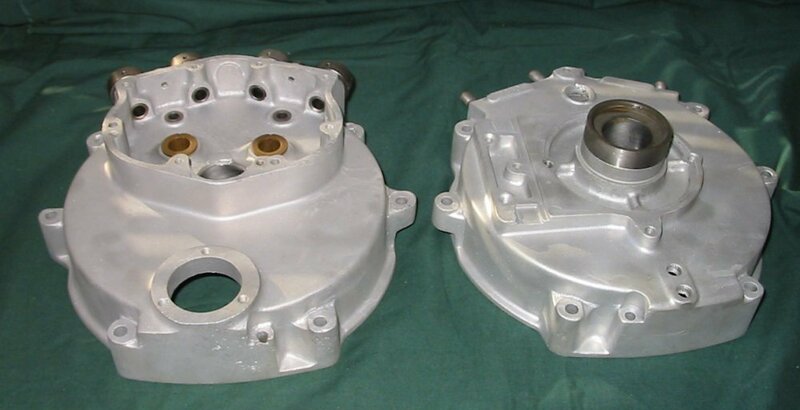 I need to check the sump valve in any case, and the gearing could also usefully be raised a bit. I didn't have enough oil with me, so ended up buying some mineral 10W40, which did what it should. Saved the last 50 oil for the gearbox and primary, which are inter-connected on mine. 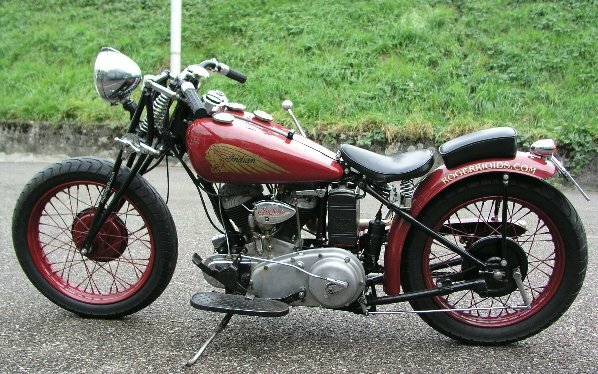 The clutch slips a little, but I am not sure if it is an adjustment question or the wrong oil. 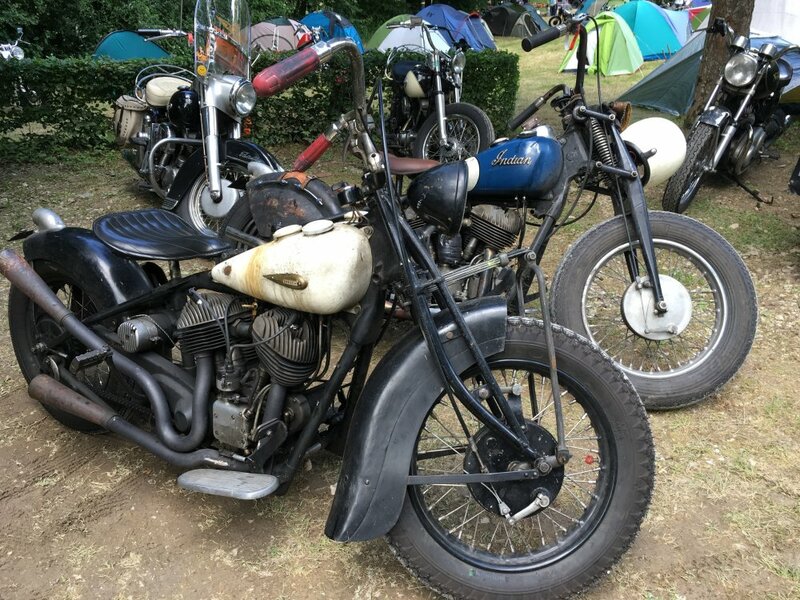 The Linkert Attacks rally itself was really good! Well organised and of course there were a lot of fine machines. It is absolutely my impression that the other Danish riders there (8 in total) also felt that it had been a fantastic trip. 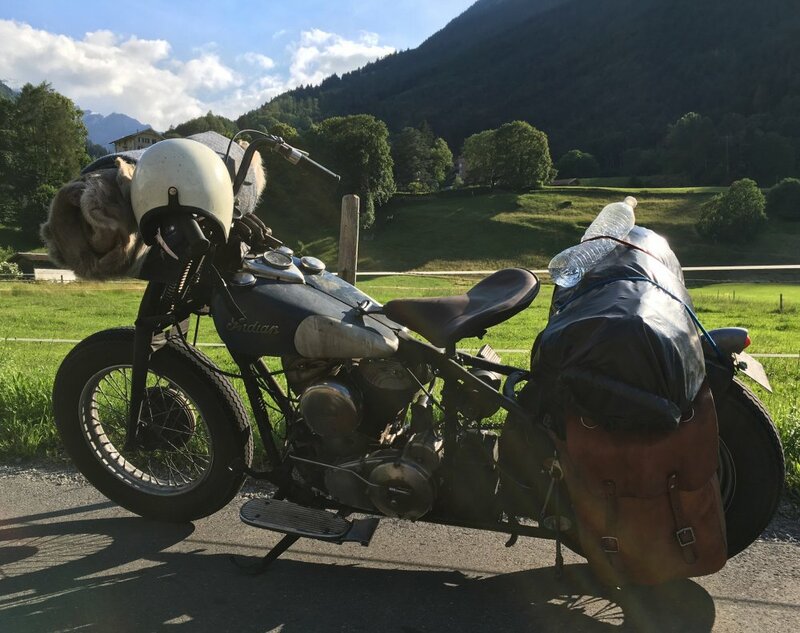 When the rally was over I went towards Switzerland with two Australians on a European round trip. 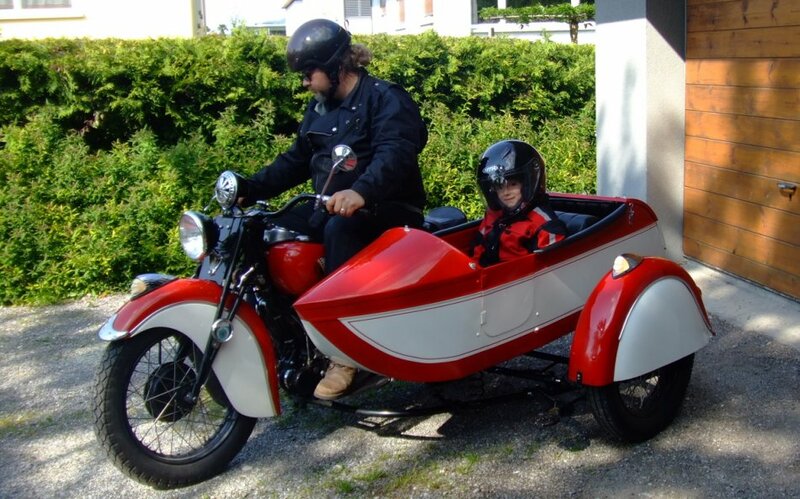 There we spent a couple of days racing around the Alps, before going back into France and, from there, on to Belgium. 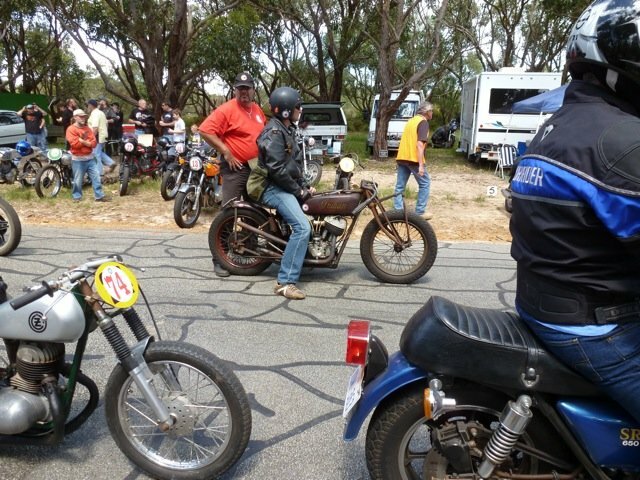 The Chief had to work for it - both of the Aussies were on Shovelheads - but it kept up without trouble. The steep mountain roads were absolutely no problem either. 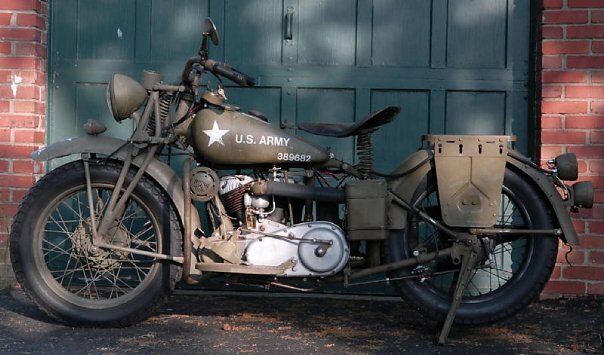 I was left a little behind on top speed, though; my gearing is on the low side and I didn't like to force the Chief at high rpm. 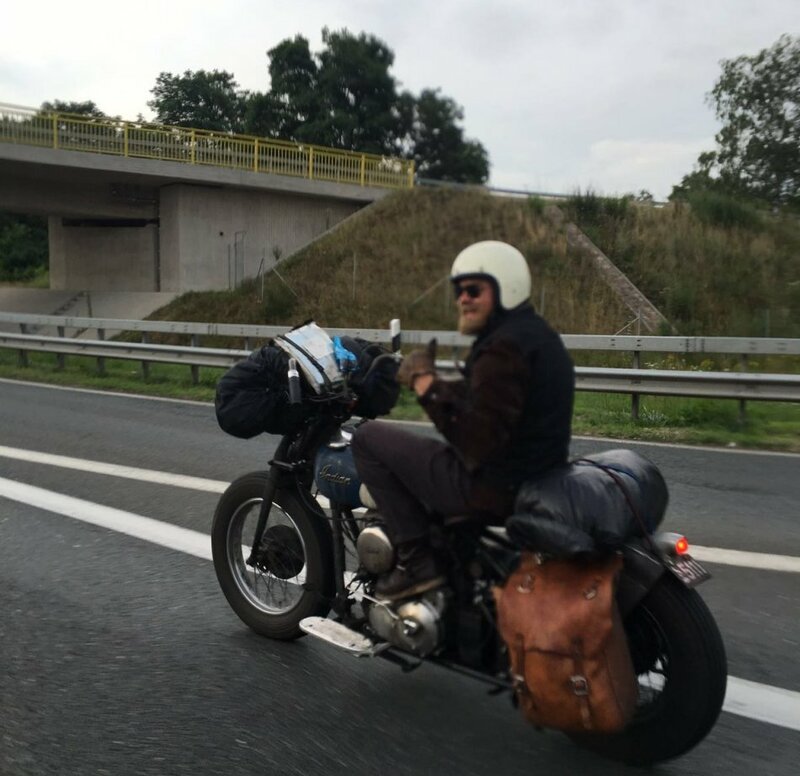 On the way back to France, Kevin (one of the Aussies) came up beside me and signalled that I should pull over. It turned out that the cotter pin for the rear brake rod had fallen out and the rod was dragging on the ground. Pulled over and put it back together with a spare bolt I had with me. 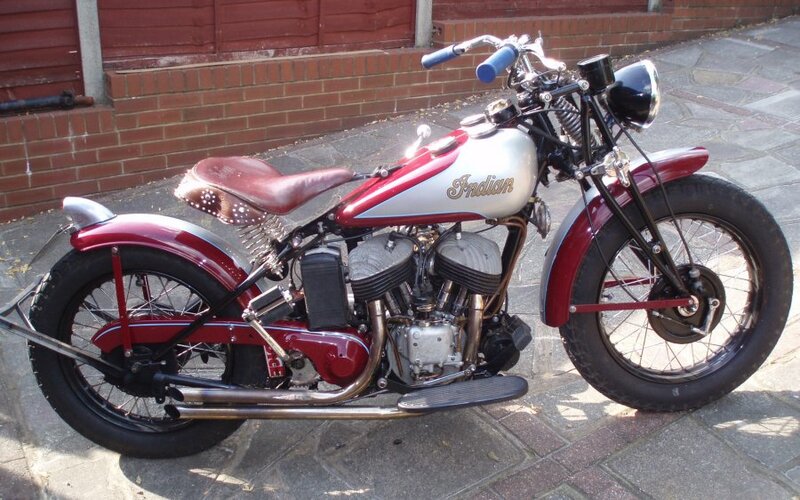 Easy and uncomplicated, but it could have ended badly as the front brake isn't all that sharp. In Belgium a small thunderstorm broke out in my ammeter, so I ignored it the rest of the way. At home, I have taken it off and bypassed it. It sounds like everything has shaken apart in there, so I am going to open it, put it back together and fit it as just an ornament. The rest of the way home was long. 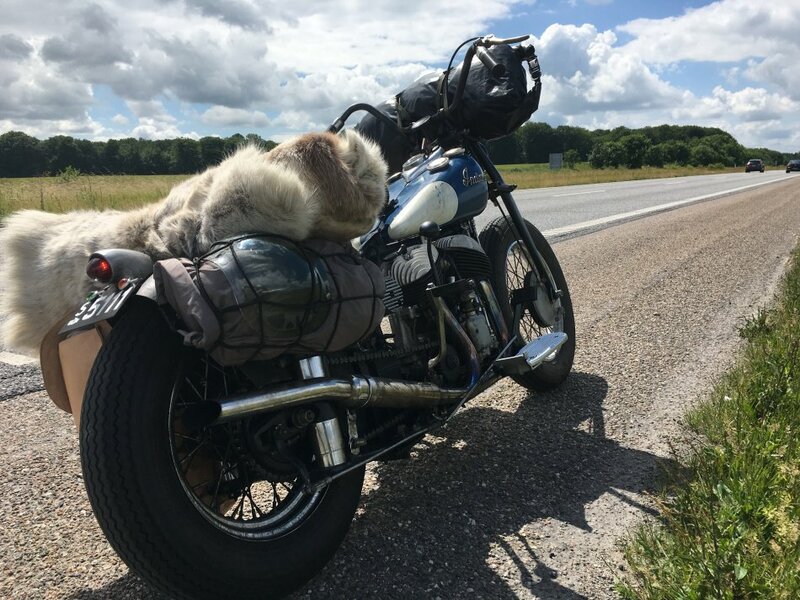 Ended up going the 1000 Km (620 miles) from Lokeren in Belgium to Copenhagen in one stretch. Was home 5:30 Friday morning. 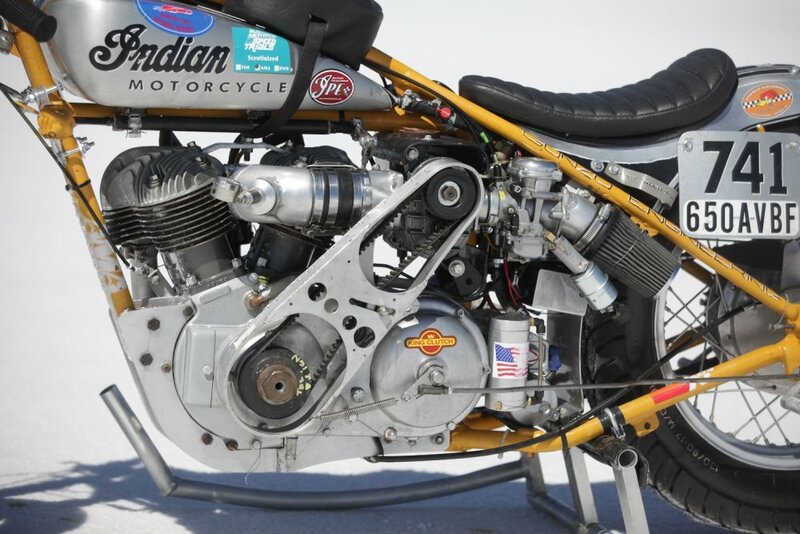 No Indian racing at Bonneville in 2015; the salt was too wet for both SpeedWeek and Bonneville Motorcycle Speed Trials. 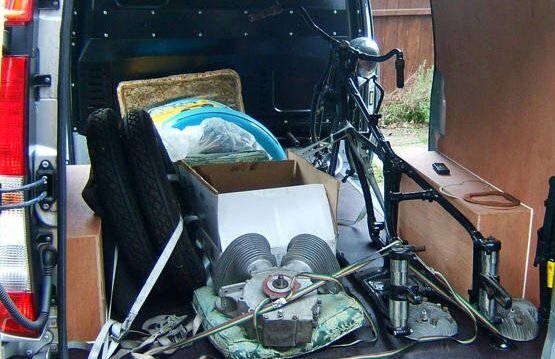 This was a particular hard blow to Chris and the British group of racers who had worked and saved hard to be able to send a containerful of race bikes over for SpeedWeek. 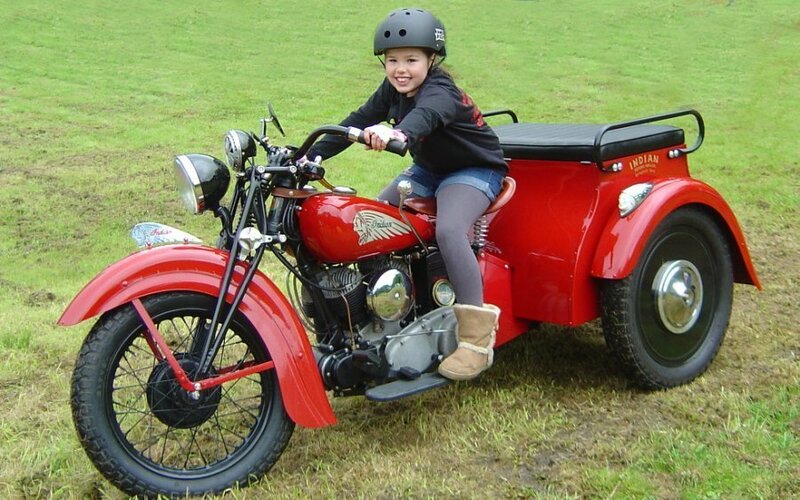 Fingers crossed for better weather this year! I hope to have an update from the 2016 races, but I not sure yet which (if any) of the IPE-affiliated racers are going to be racing this year. Stay tuned for more Indian racing news. 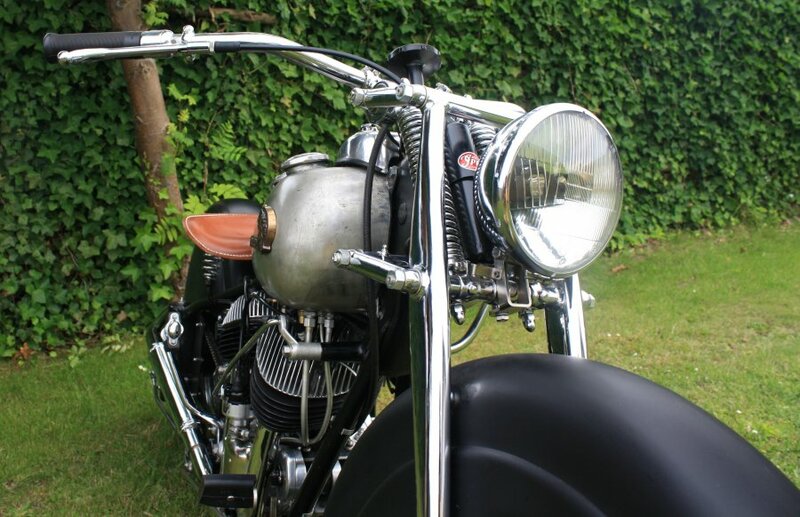 1) An engine that survives repeatedly running 5000+ rpm flat out over several Km/miles is likely to last really well when ridden in a gentler manner on public roads. 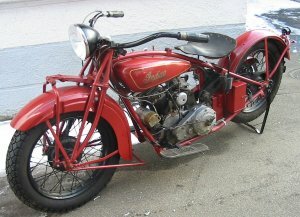 2) As Indians have only 3-speed gearboxes from the factory, and as Bonneville bikes are generally pulling high gearing, the need for the race bikes to pull through the gaps between the gears means that they have to make usable street-style power over a wide rpm range, and not just at high rpm. This is also directly relevant to street riding. 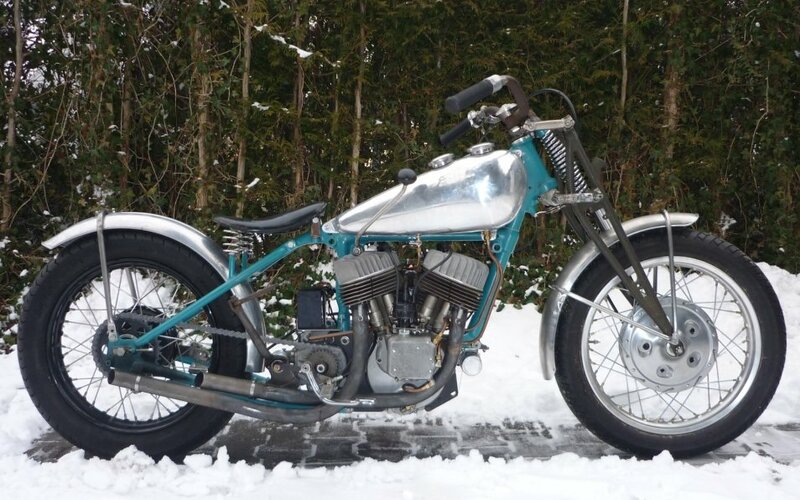 Actually, the "IPE Bonneville 741" engine specs I try to steer everybody toward makes for both a reliable racing engine and a really nice street one. 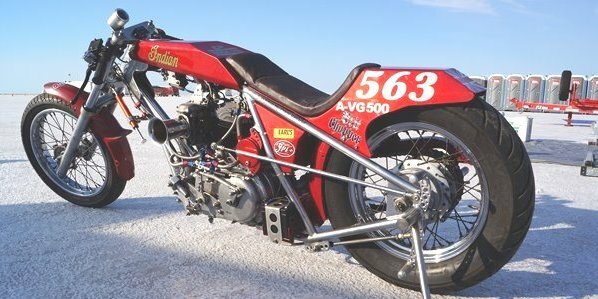 Going fast at Bonneville has less to do with engine power than with wind resistance and, in any case, they only count the winners at the finish, so if your engine blows up before the finish line nothing else really matters. 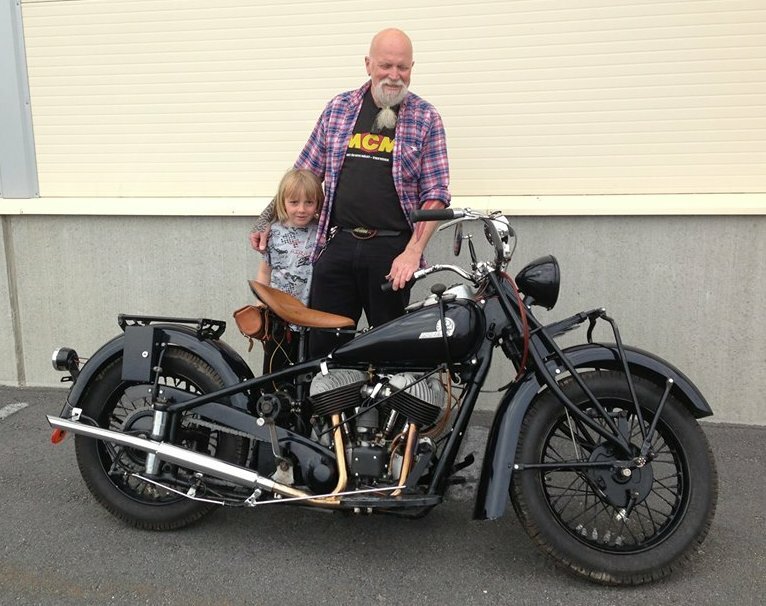 Kjell's 600cc 741 street bike - running good! 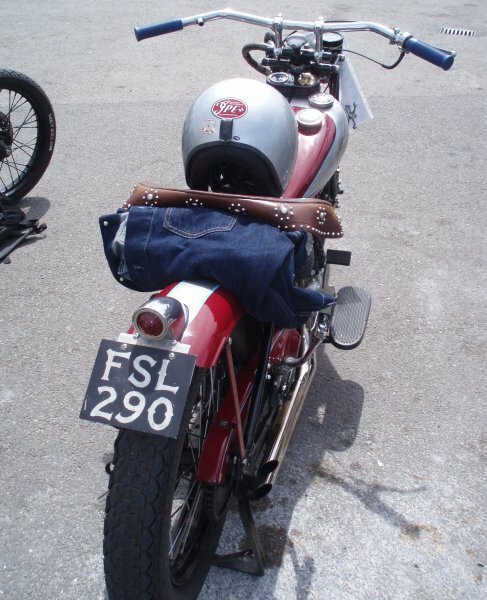 Here is an example of a 600cc 741 for the street. 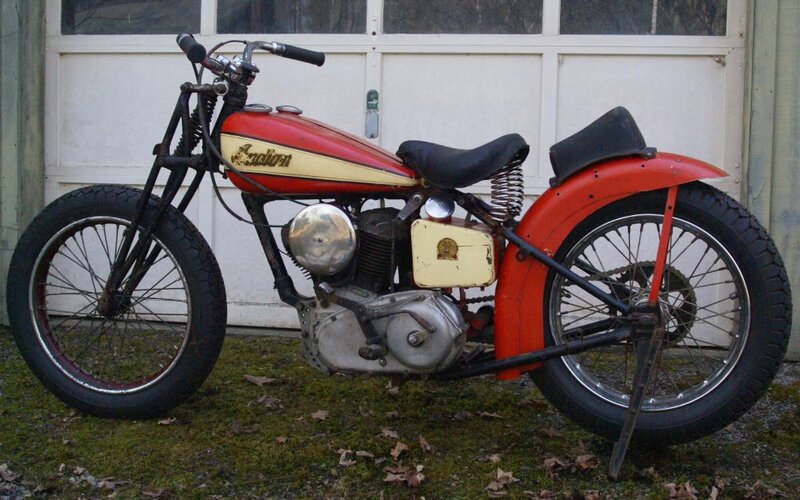 Kjell's bike has a Keihin CV carb, electronic ignition and tuned exhaust. Stock cams and everything else. 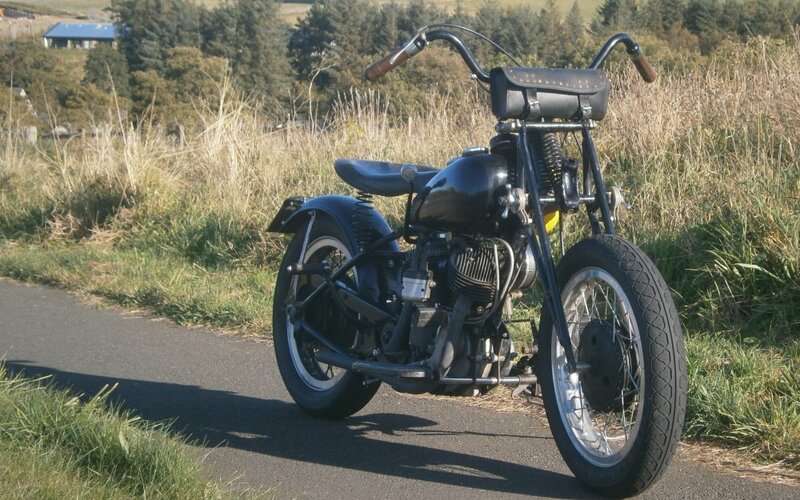 Basically the standard "IPE 600 741" I am talking about, and another bike IPE has been consulting on/supplying parts for. 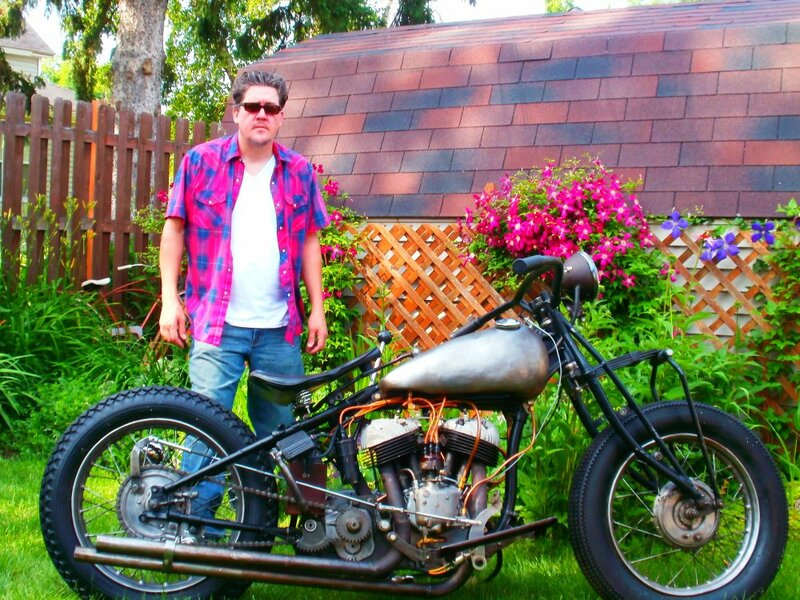 It runs 18/36 tooth sprockets, which is effectively the same 2:1 gearing Chris ran at Bonneville in 2012. It does 90 Km/h (55 mph) at 3000 rpm very comfortably in third gear, and easily runs up to 85 Km/h in second. It has gone 130 Km/h (80 mph) with more left. 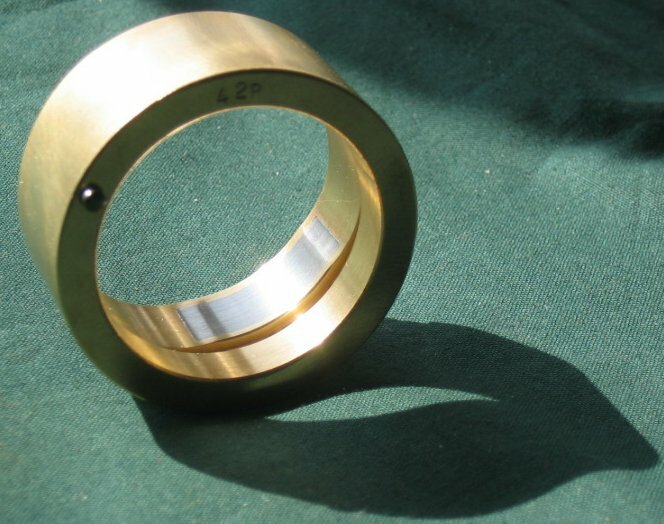 Cam ring for Bosch D magneto. Super high quality. I have these to order for other cylinder angles too. 101 page. 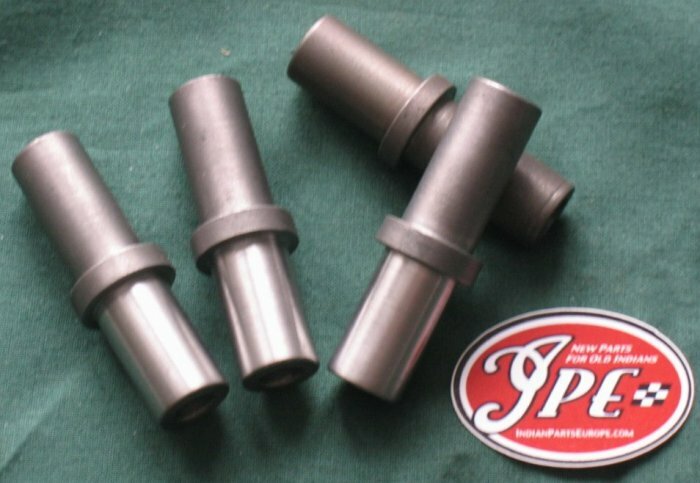 Valve guides for 101 Scout are made to measure. 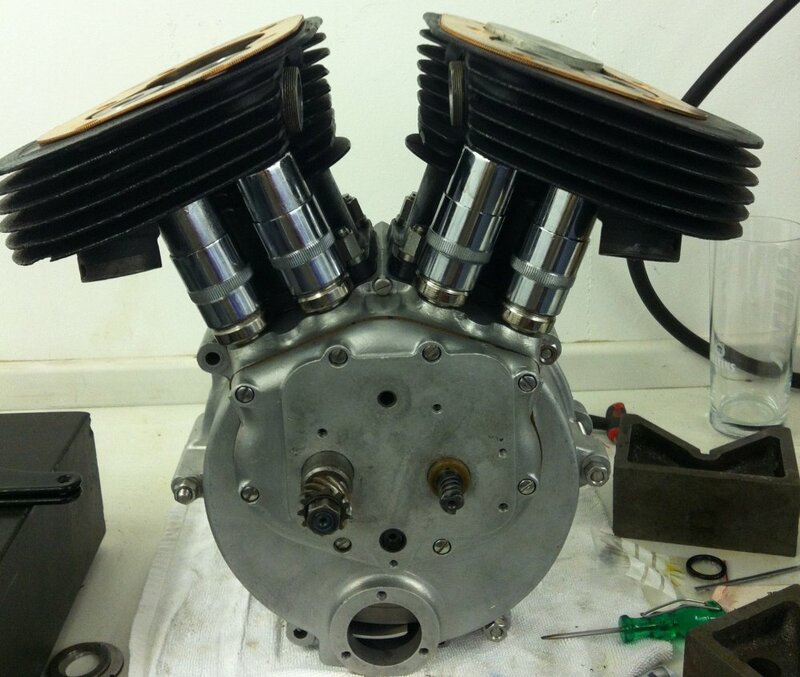 The youngest 101 cylinder is now 82 years old, and the holes for the guides usually need resizing. These guides fit late 1925 to 1927 Scout too. 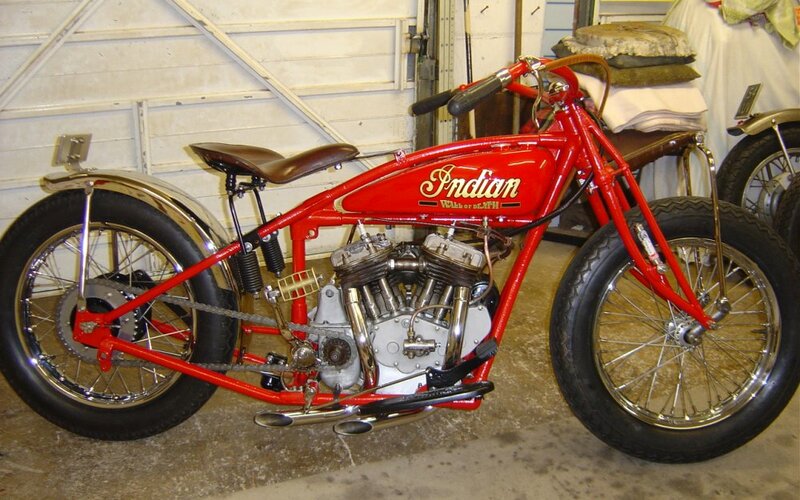 You don't really need very many special tools for working on your Indian. I hope I can get around to making a page with them soon (I have all of them, in stock or to order), but here are some really neat valve cover pliers. Be kind to your covers and don't use big plumber's wrenches on them! For Chief and 741. 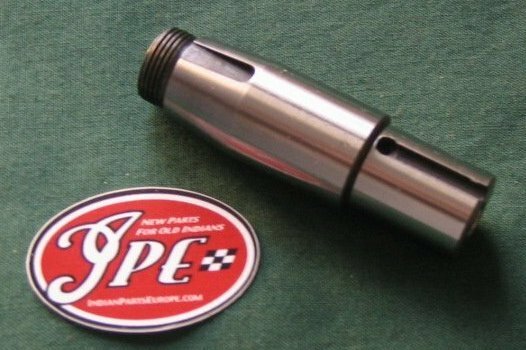 Valve guides for 741 are available in STD and 0.1mm (.004") oversize to allow you to reclaim cylinders with worn guide bores. 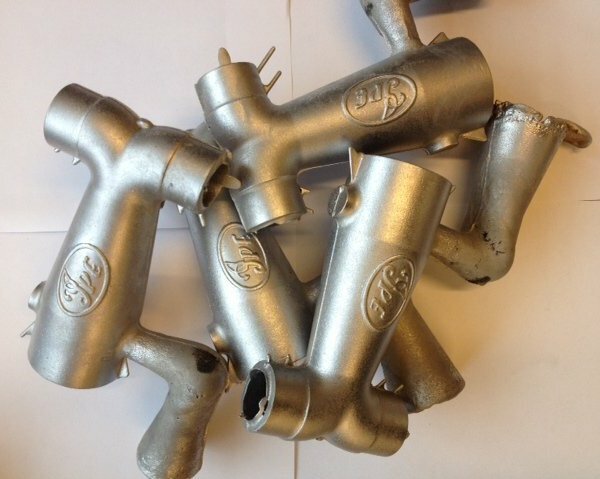 Like the 101 valve guides, these are made in Denmark from really good quality cast iron. I don't have much for Powerplus, but here is a Powerplus pinion shaft made for a customer recently. 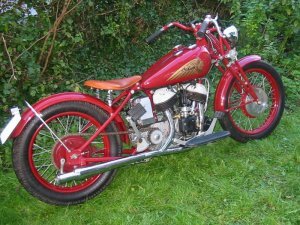 Powerplus crank pins and reprints of the 1916-21 factory parts book also available. Serious, high quality engine repair work is another IPE specialty that I have neglected a bit to point out. I will try to write more about this soon, but here is a primer. 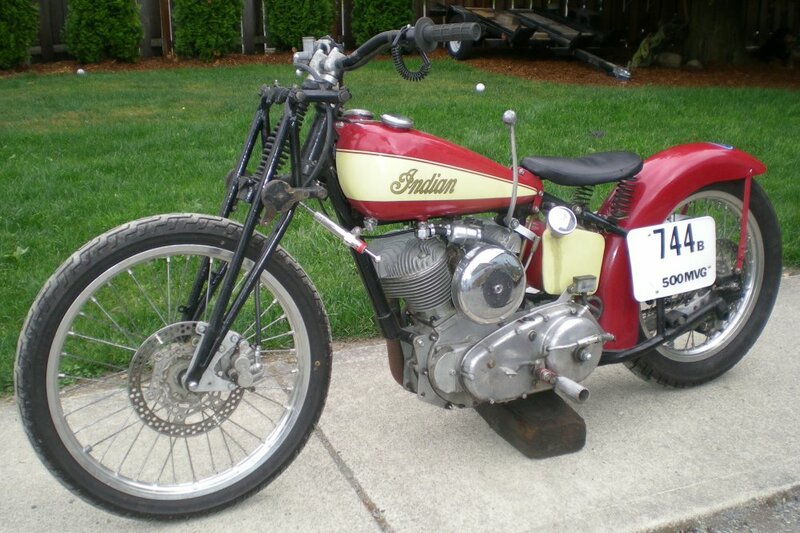 Email me if you need advice on any aspect of making old Indian engines as good as better than new again. 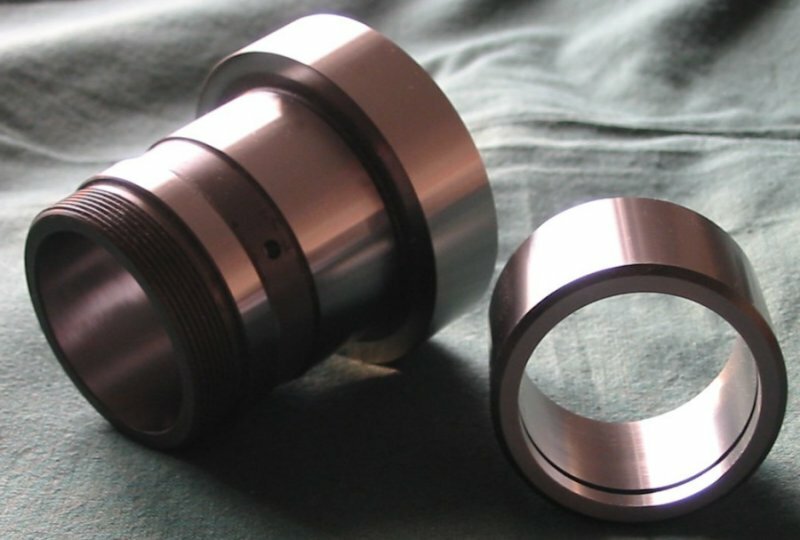 IPE makes bearing housings and rod races to custom oversizes all the time. 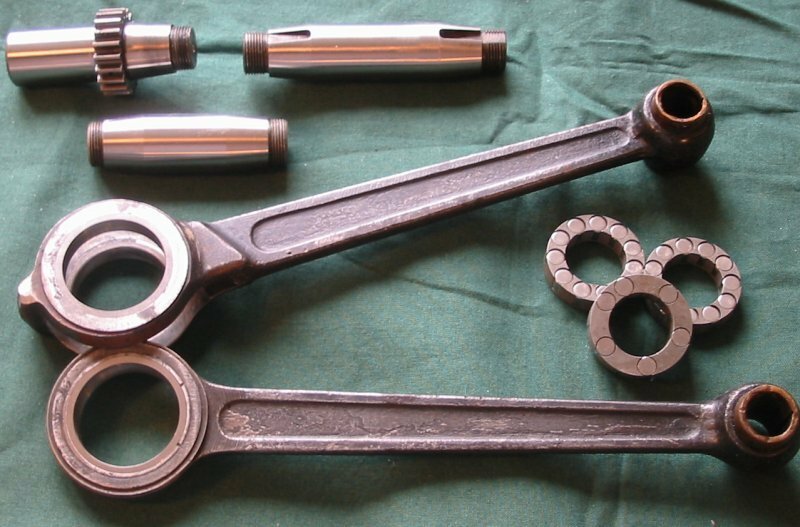 This means you can get whatever you need to repair your cases and connecting rods. News page. 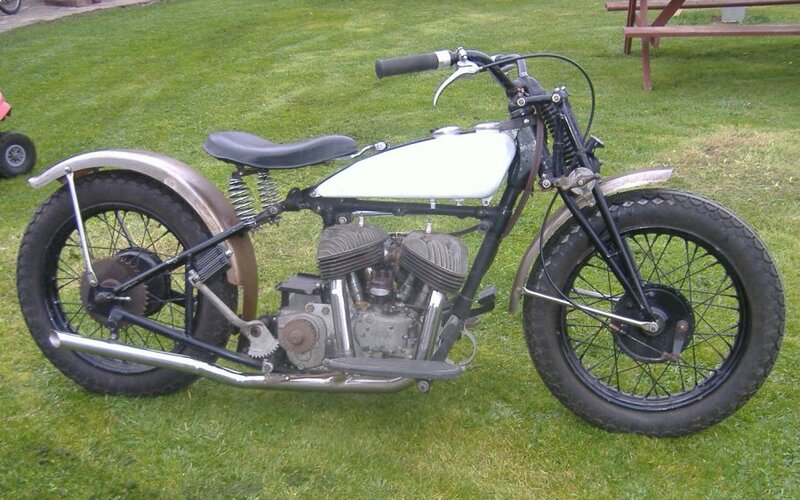 Here's a set of 1914 rods that have just been rebuilt with new rod races, shafts etc. 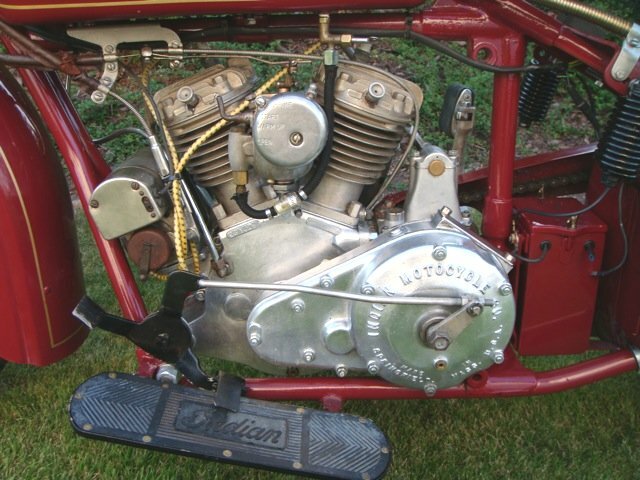 Timing shaft, with its integral pinion, is an original that has been reground. Owner will fix pin bushings himself. More new parts coming soon. If there is anything you want to know more about, or are not sure about, just email me. When you look at all the goodies here, please bear in mind that IPE is just a small one-man shop, and can't have everything in stock at all times (although I try). Also, many parts are made to order - or in small occasional batches - and may not always be available just when you want them. 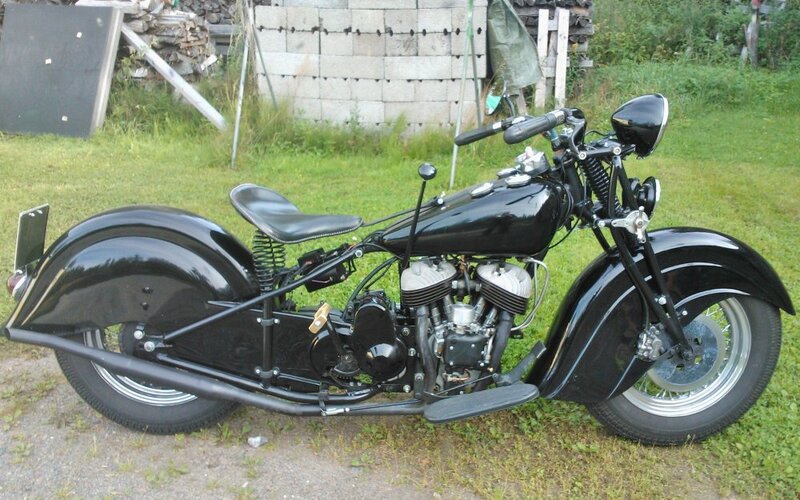 So it is always a good idea to plan ahead and start talking about your parts in good time before you need them. Remember; I am here to help - I care about your Indian project - if you have a problem, get in touch and we will work it out. 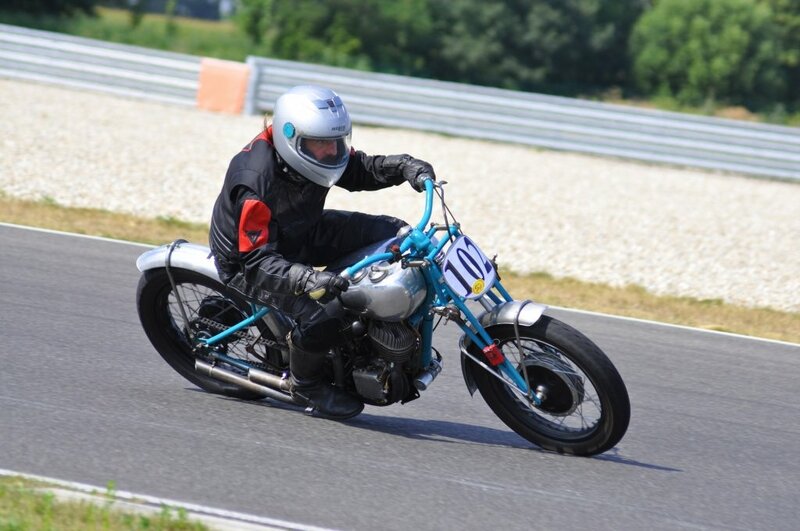 Helping Indian Racers Fly the Flag - Testing IPE Parts and Engine Work under Racing Conditions - and Having Fun! 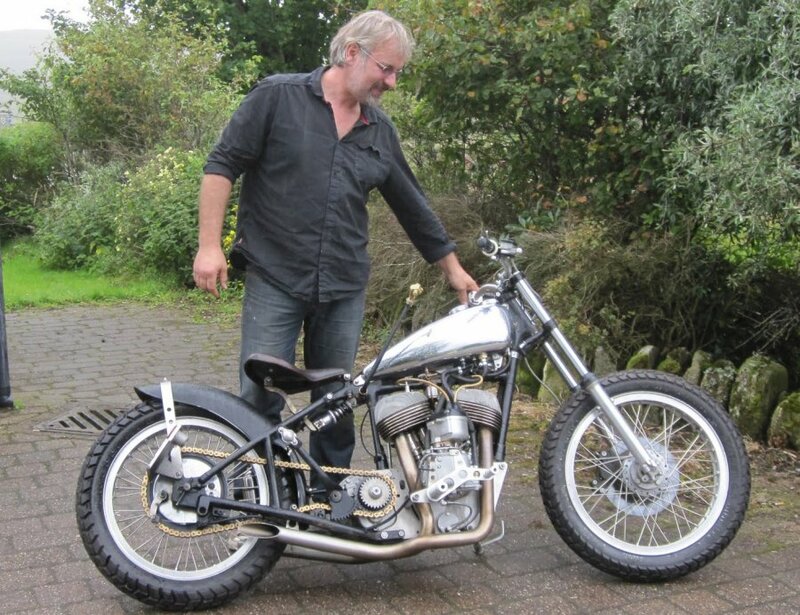 Here is Neil's report from BUB 2013. 2012 report here. 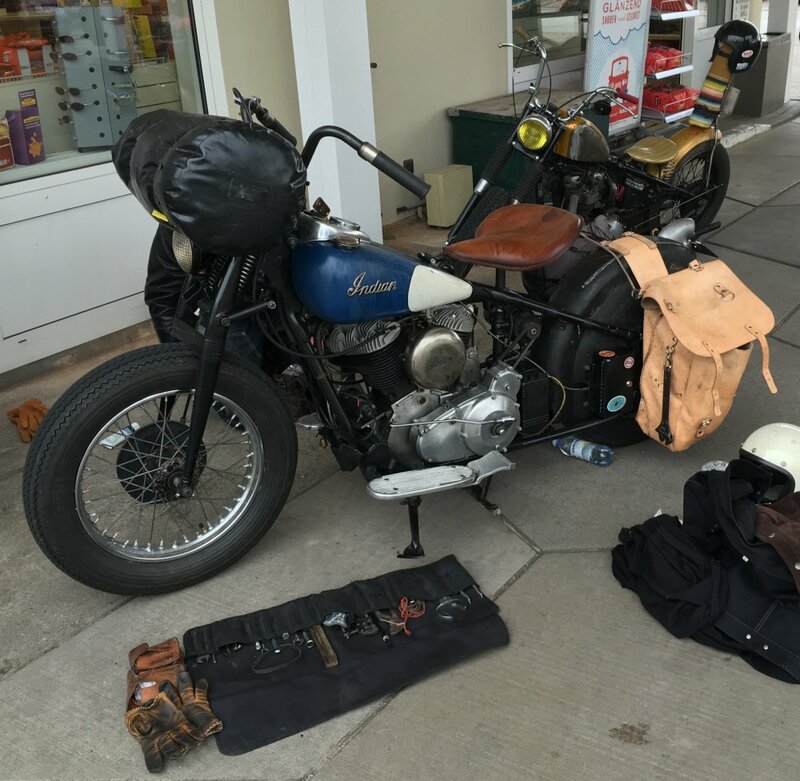 We had a great BUB meet at Bonneville with several bikes but the little 741 really broke through this year. 2013 version of the 741. 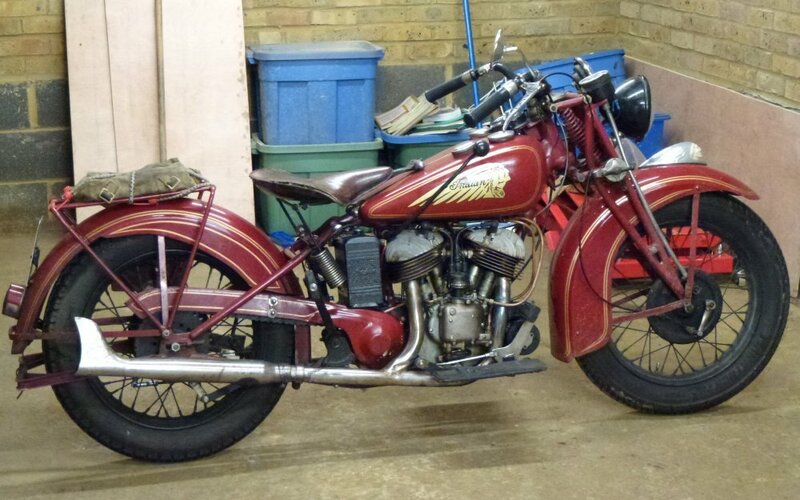 Remember, this is a fairly stock 600cc 741 engine with good ignition and a CV carb. 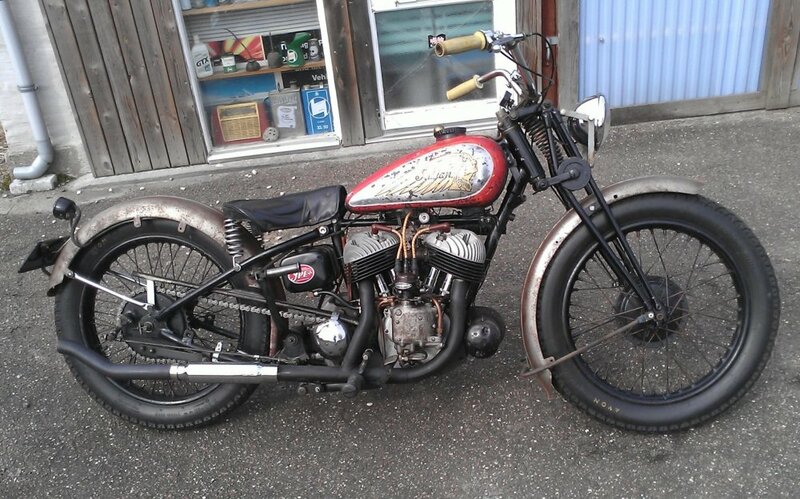 An engine like this also works great for a street bike. As it turned out a couple of things were the cause of our lack of power and seeming over geared problems last year. 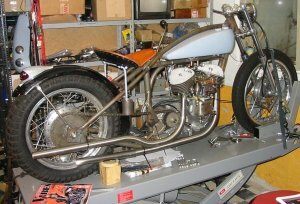 First improvement after installing a better more stable fork was the installation of a Joe Hunt magneto tach sending unit and tachometer. We'd been guessing what things were doing by the seat of our pants, shifting accordingly with no real idea. 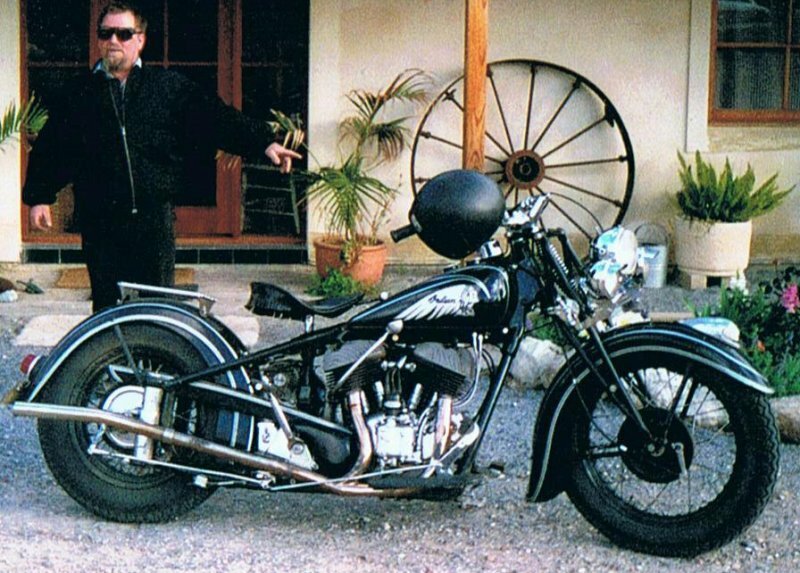 Lyle especially had been short shifting the bike and not letting it buzz when he rode it, I assume thinking it should be ridden like his Chief. Not criticizing, just the way things work when you get set in your riding habits. We found and cured an intake leak that was throwing us off on our jetting which is currently at 150. We also had a timing issue with the magneto, a combination of a clamp that wouldn't hold on and simply not timed correctly. 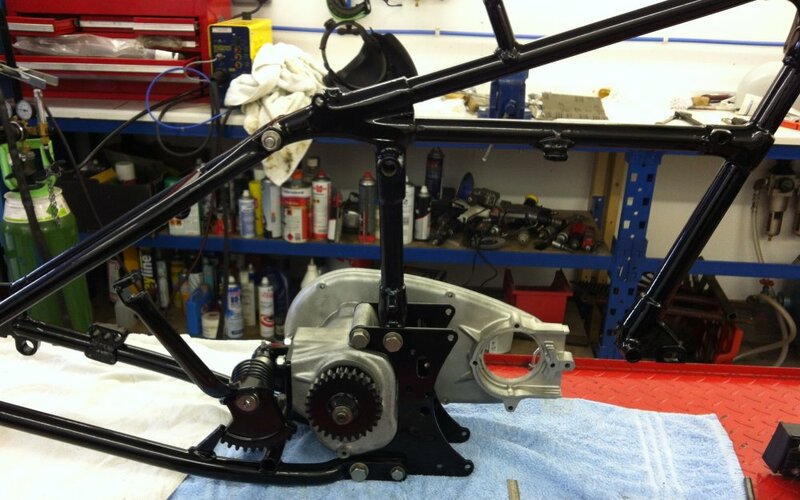 Corrections made, we decided to try a 15T sprocket on the front with the 36T on the back. Practice runs behind the pits showed great increases in revving and easily pulled the gears for a change if revved clear up in the lower gears. 741 and Norton on the salt. Our first run came back with a 76.8 mph (123,6 Km/h), not screaming fast but there was obviously room to grow. Rejetted from the previous 160 we went out again and made an 82.2 mph (132,3 Km/h) run. Things are looking up. I didn't have a 16T in the sprocket bin so we came back with a 17T. Rick was able to rev easily near 5500 rpm so we hit the practice track again, a little tougher climb but in a mile we were in the mid 80s (around 135 Km/h) and climbing. Off we went to staging but sadly we were rained out for the year before we could make more runs. We think we have the ability to reach near 90 mph (145 Km/h) or even more with our current set up on the short "Run Whatcha Brung" track that only has a one mile lead. If we sign up for a record class and try the AMA Mountain course next year we would have a two mile lead on the timed mile and that might allow us to accumulate even more. Testing in the coming months should indicate if that will work. I've also ordered some more rear sprocket blanks in one tooth increments so we can split the gearing in smaller jumps. 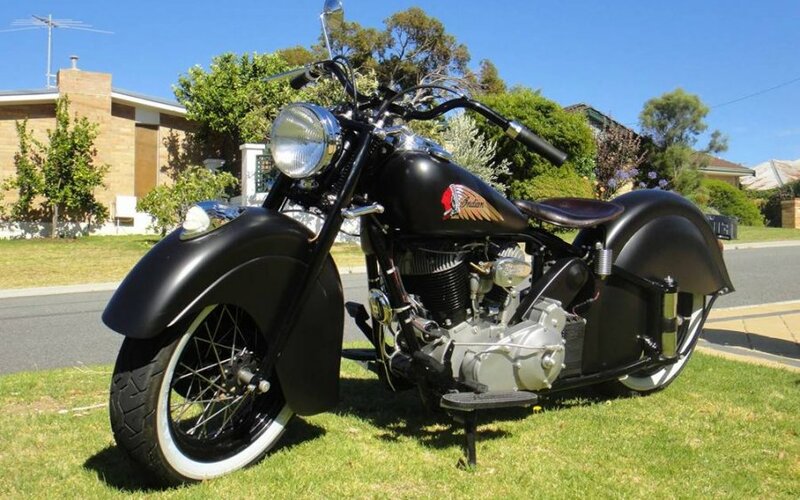 So things are looking way up again with the little Indian and we plan to hit the salt again next year with a vengeance. PS: The CV carb worked absolutely great! My thoughts after reading this are: Man, those little 741 engines are nifty! (but I kinda knew that). 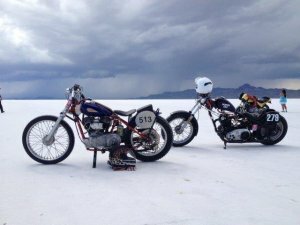 Remember that the combined altitude and temperature at Bonneville typically robs engines of 20-25% of the power they have at sea level. 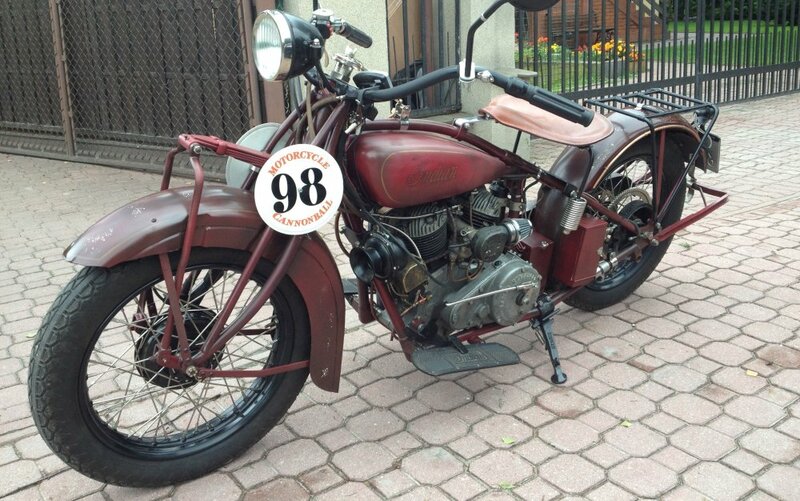 Any bike that goes 80+ mph, more than 130 km/h, at Bonneville is bound to be nice and lively on the street. 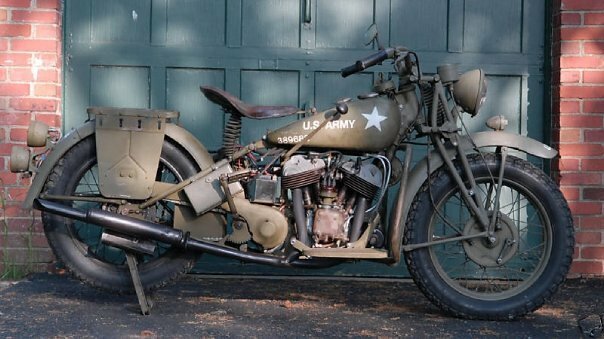 For a 70 year old bike, at least, which is what we are concerned with here. 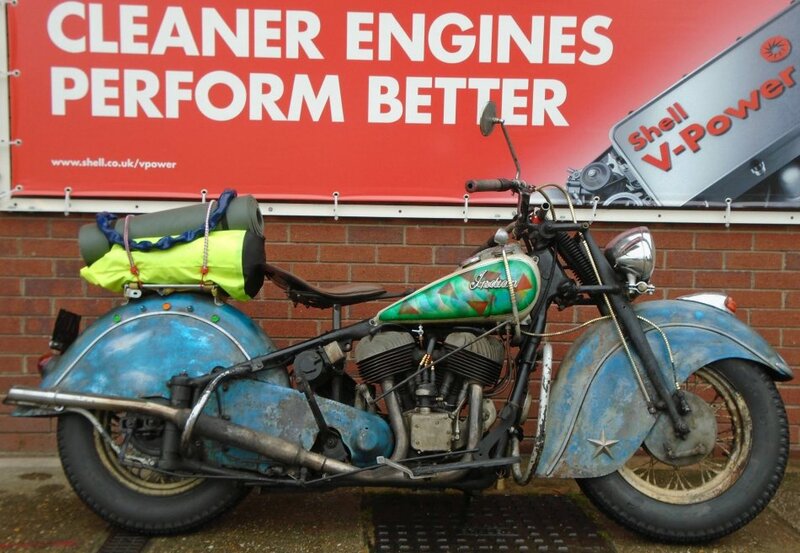 Neil's report also underscores the importance of gearing and carb jetting to get the best from your bike. 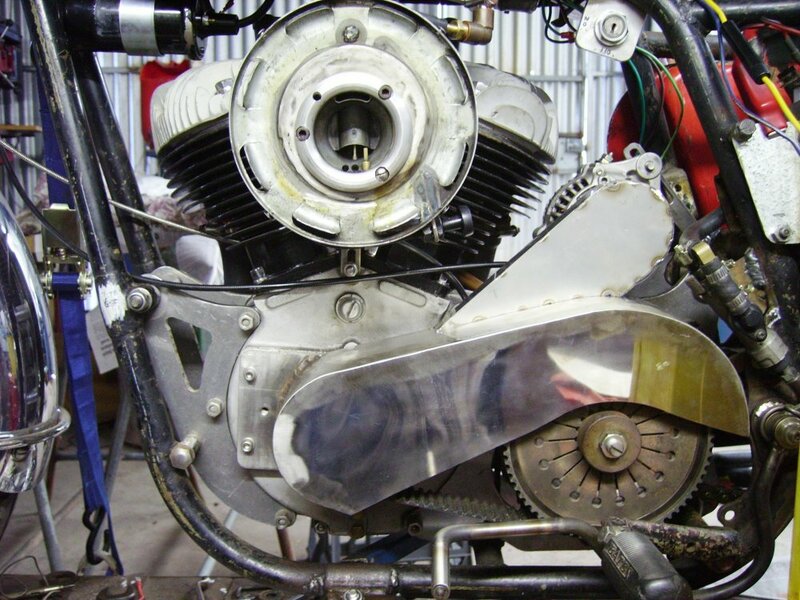 Gearing is more of a compromise for street riding, as there are other parameters to consider besides sheer speed, but it still pays to experient with gearing on your street 741 (I usually have gearbox sprockets from 16T to 27T in stock). The same goes for carb jetting. Experimenting with ignition timing can also make your engine run a lot better. 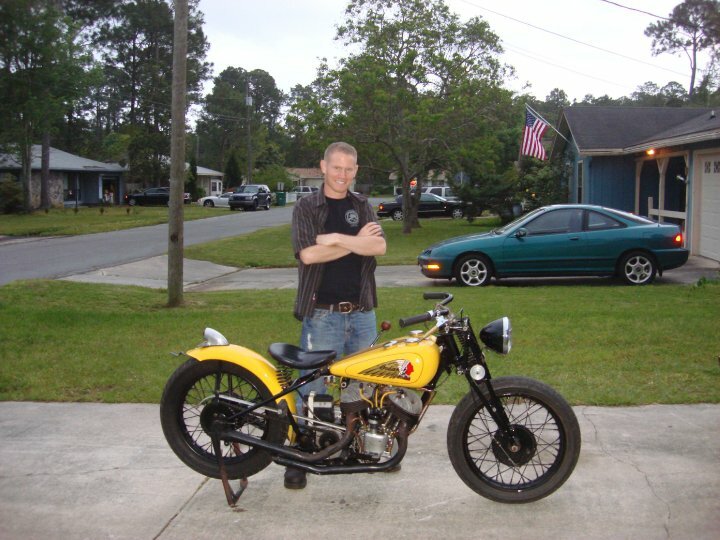 The best place to set up carb and ignition is on a dynamometer, but you can get far with a methodical approach, testing on the street. 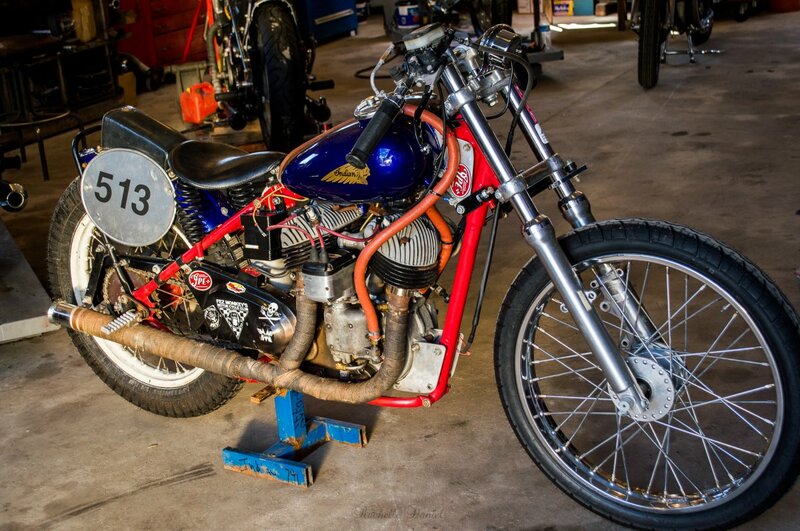 For a land speed racing bike, dyno testing can be an even bigger help. The underlying assumption is that, while power drops at Bonneville compared to sea level, the rpm where the power peaks stays the same. I have not heard or read anything to the contrary, but I'd love to hear from anyone who has proof that it isn't so (or that it is, for that matter). 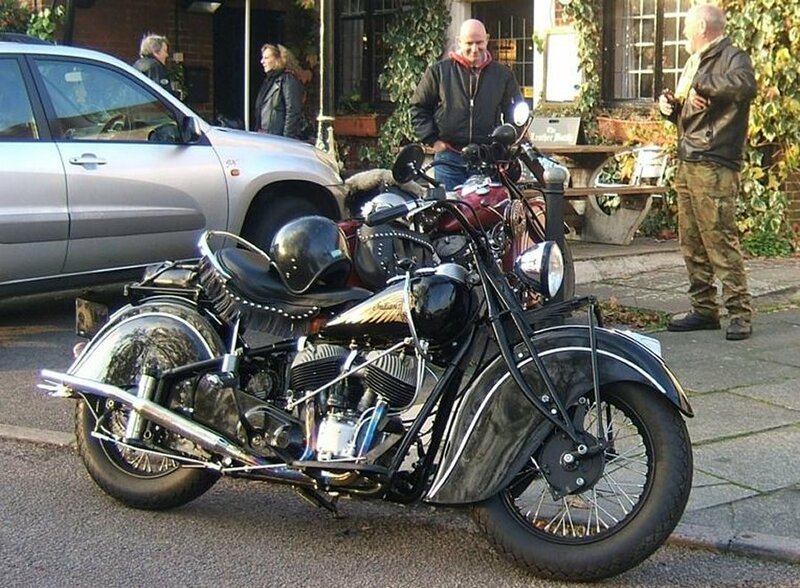 If you know the rpm (as per the tach on your bike, for consistency) where your engine makes the most power, you will have a hard target for your gearing. If the engine will just pull max HP rpm in top gear, this is the fastest it can go. Gear down if the engine won't reach peak rpm in top gear, and gear up if it wants to rev higher. It can be a help to make a gearing chart, or table, at home, to minimize confusion at the races. The chart [.pdf] posted here as an example is for an engine that makes the most power at 4700 rpm. It was also interesting to hear that a well put-together 741 with stock rods and flywheels will rev safely to 5500. While suspecting that the actual mechanical limit was higher, I suggested a conservative redline of 5000 on both Lars' and Chris' engines, since nobody had any real idea how high you can safely go (it felt more important to keep the engines in one piece than going a little bit faster). I suspect that both of them revved faster in the gears, but good to see Neil confirm that the engine will survive at least 5500 rpm. Finally, it is good to have confirmed - again - that the big Keihin CV really does work on 741s. 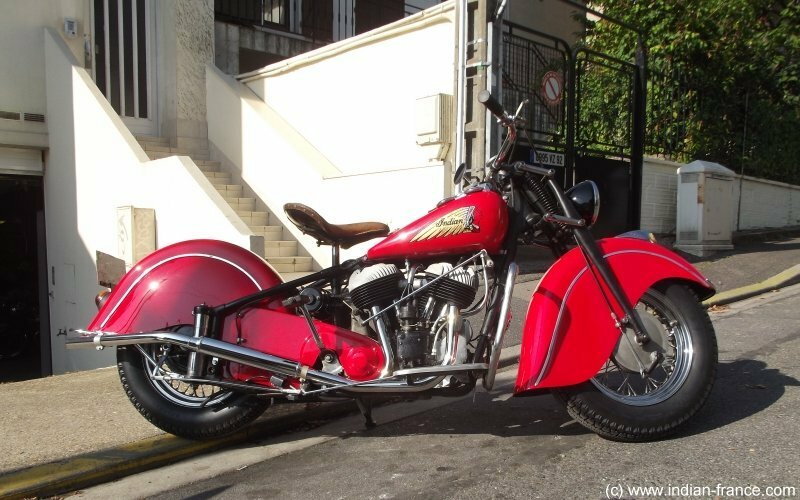 It "should" be much too big for 300cc cylinders, but the variable venturi of the CV carb only opens as much as the engine needs. Looking forward to 2014! Moen. and Facebook page. 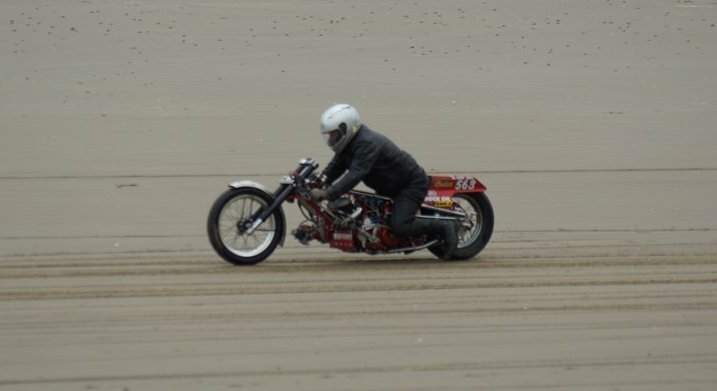 The first speed trials at Pendine Sands in Wales, June 22/23, 2013 went well. Congratulations to organizer PJ and team! Conditions were difficult with soft sand and side winds, so no super high speeds were recorded, but Chris Ireland on his IPE-sponsored Bella 741 racer (with new chassis and super charger - more about this soon) got a chance to test the bike, and found that it steered well and pulled like a train. Here's a couple of pix - and a little movie. 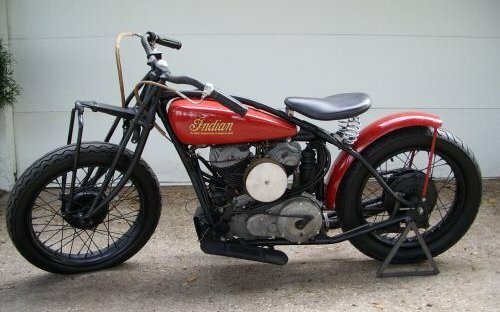 Yeah, well... IPE has SPEED parts for your Indian, and has worked on making Indians go faster, but I also have STREET parts for your Indian, and have worked on making Indians work better and last longer. The Indians of IPE's Friends and Customers. 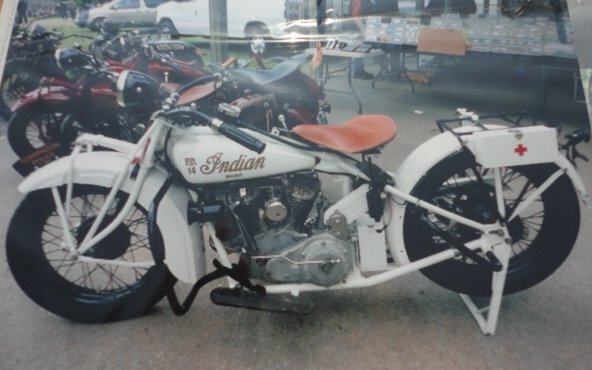 Here are some of the pictures customers and friends (the line between the two is a bit blurred) have sent me of their Indians. 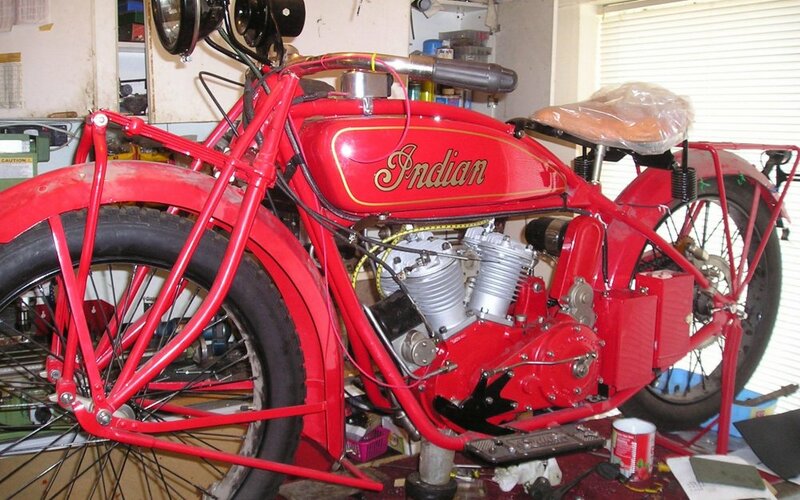 If nothing else, they illustrate just how many different ways there are to build an Indian! 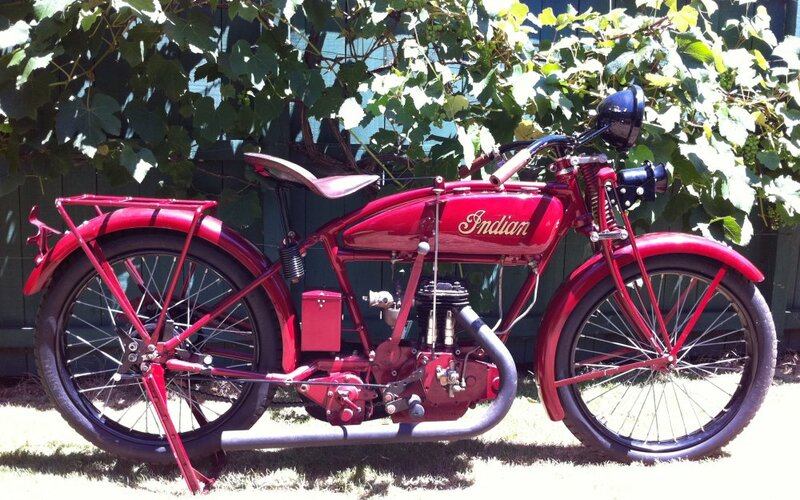 Almost no matter what kind of Indian you have - or dream of having - IPE can help with parts, services and advice. 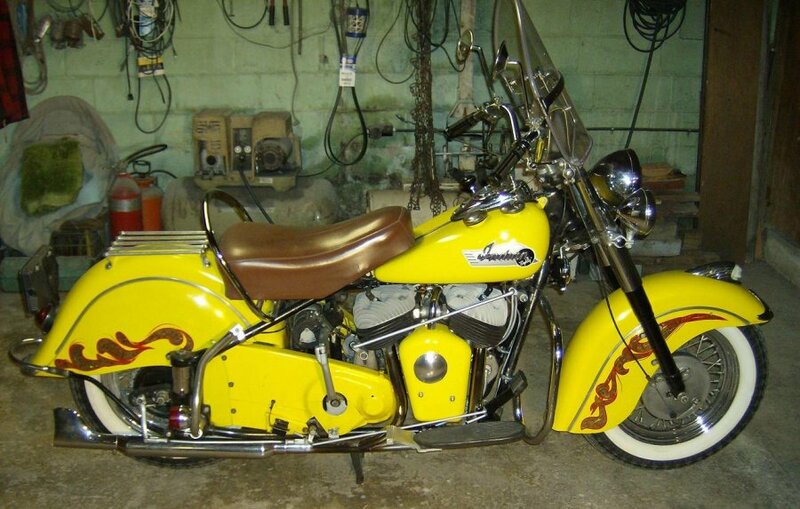 Andy's Hippy Chief - more here. 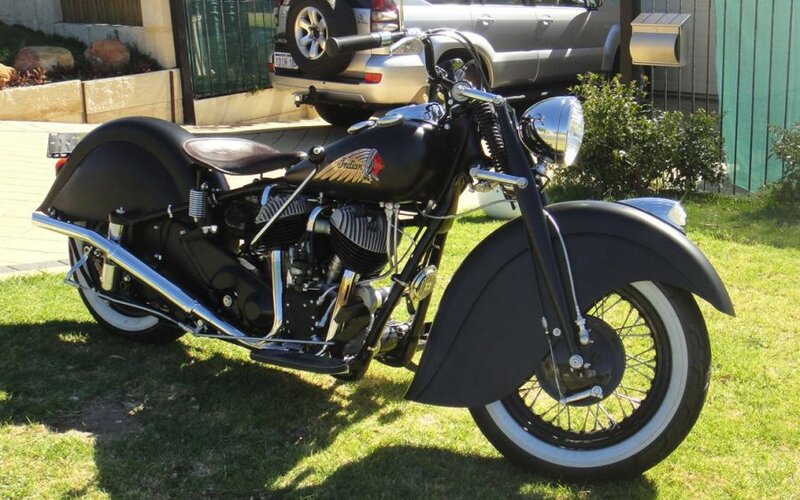 New 1939 Chief bobber makeover. 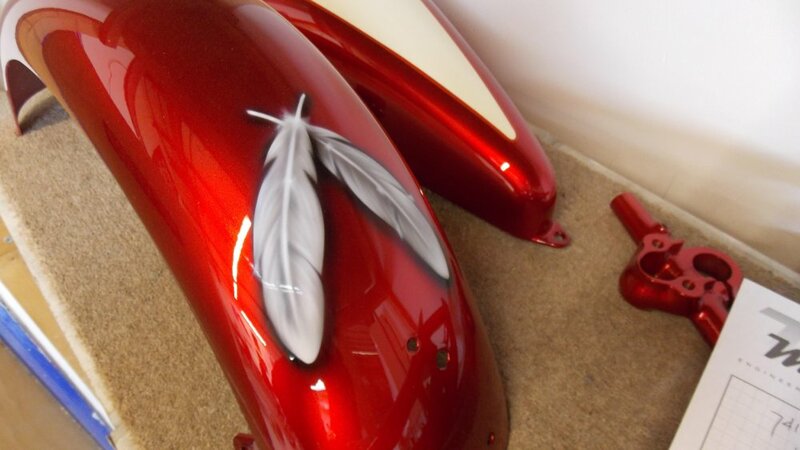 New paint on narrowed tanks. 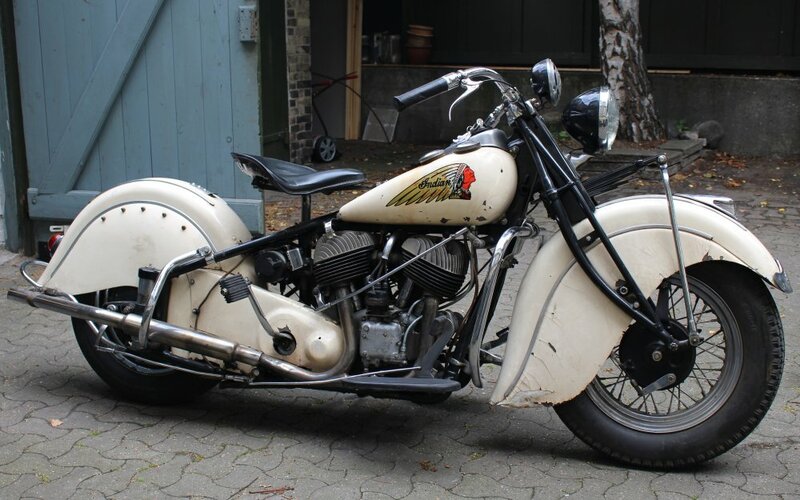 New 1939 Chief second makeover. Werner in the pits; "BMW", huh? 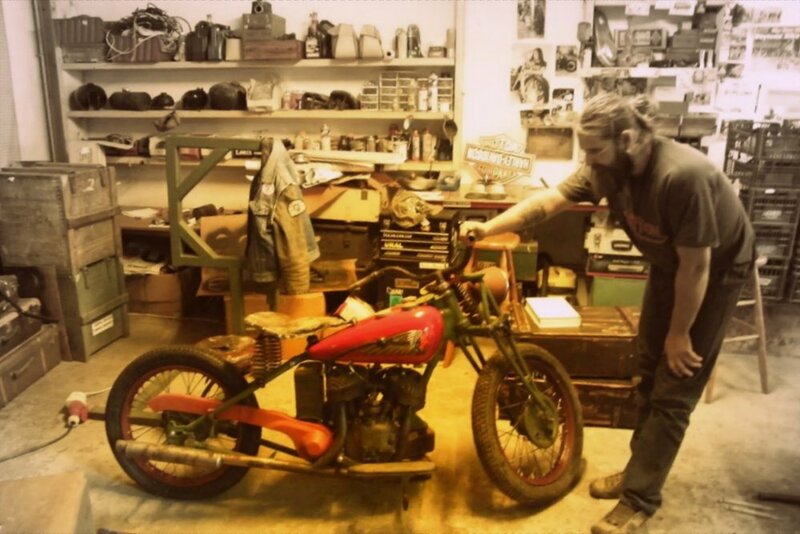 Werner racing the Sport Scout. Tony and magnificent Sport Scout. 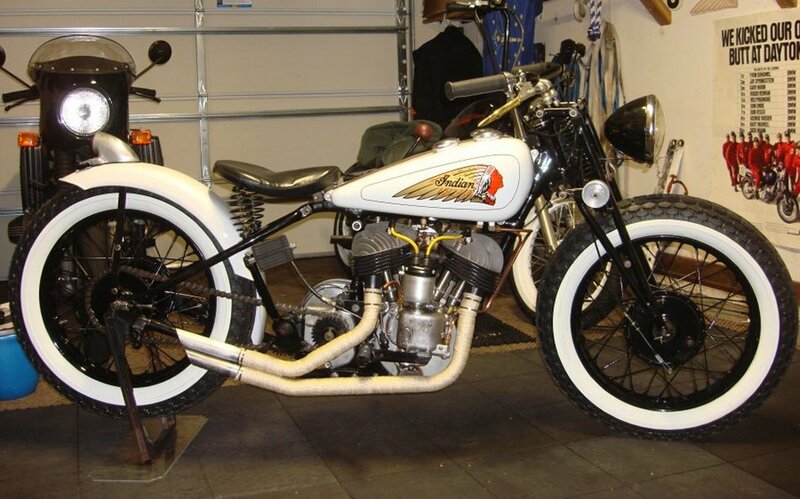 Nick's 1926 Scout coming home. 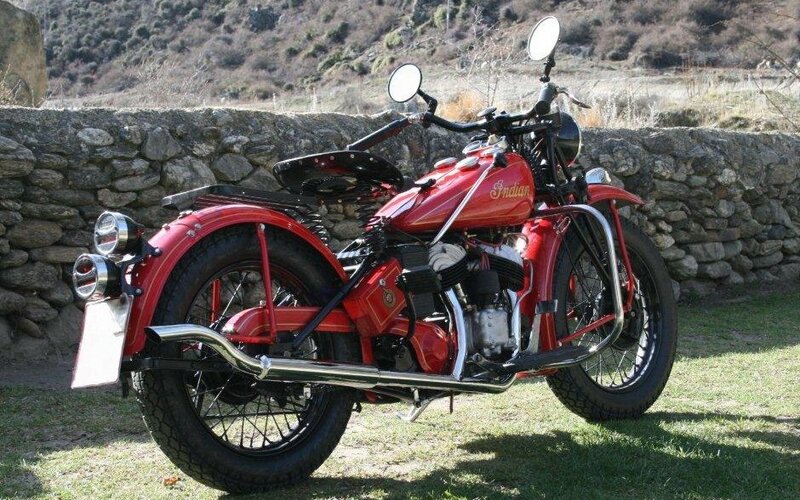 1947 Chief by Indian France. Other side looks good, too. 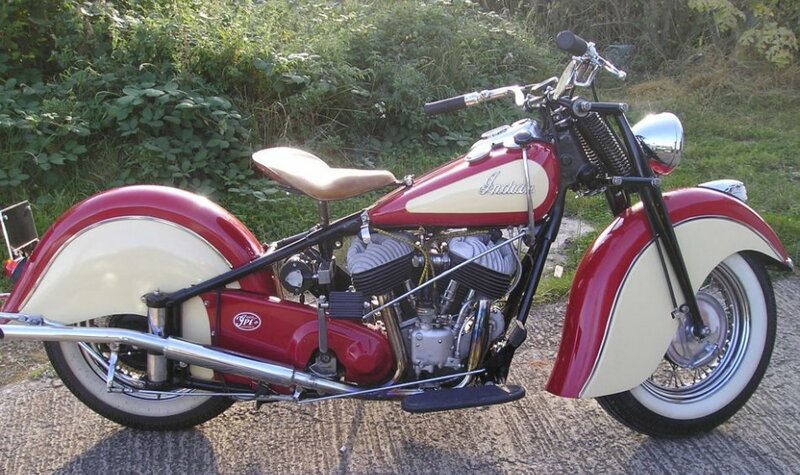 Petter's electric start 1948 Chief. 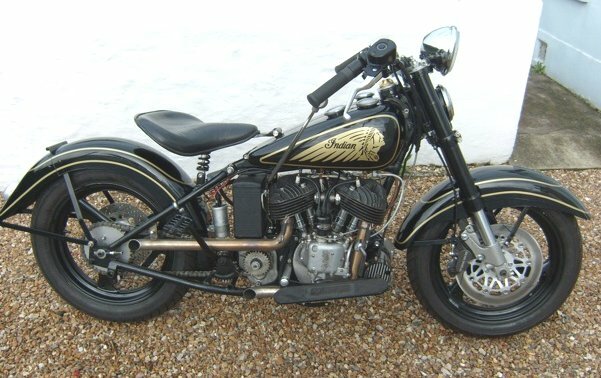 Kim's "Bison" Sport Scout special. 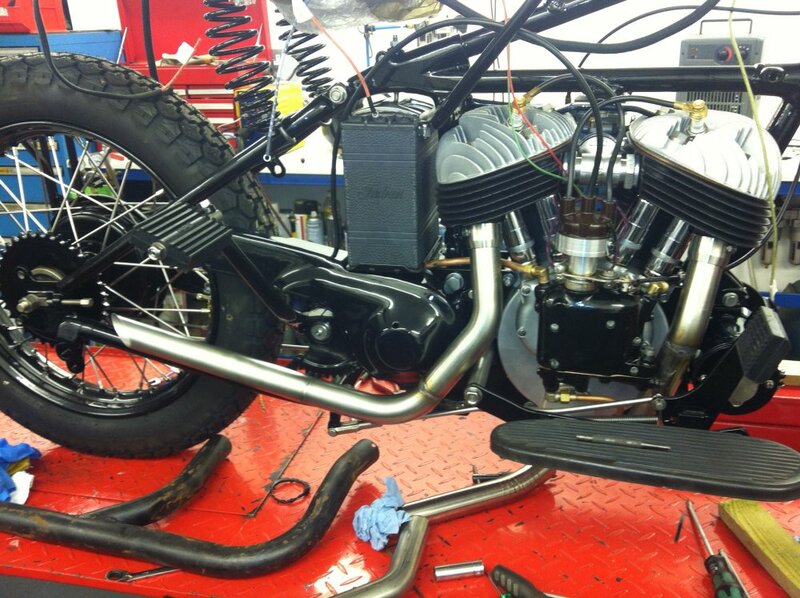 Fender for Nick's stroker 741. 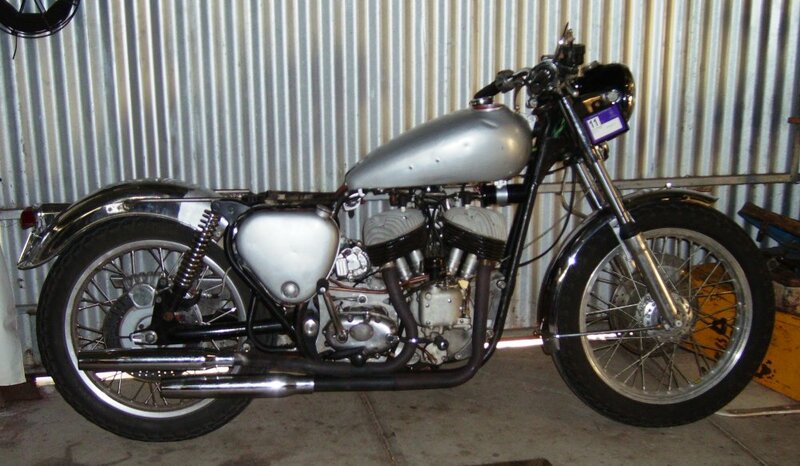 Simon's stroker 741, stainless pipes. 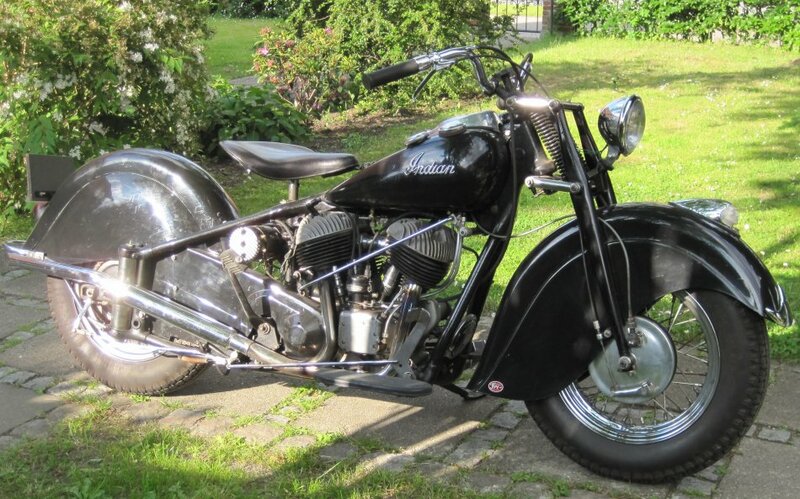 1930s New Imperial with 741 engine. 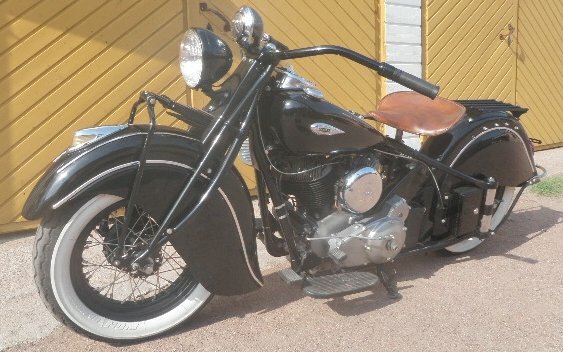 More pix of this cool special here. Basty's 741 done. Enjoy the summer! 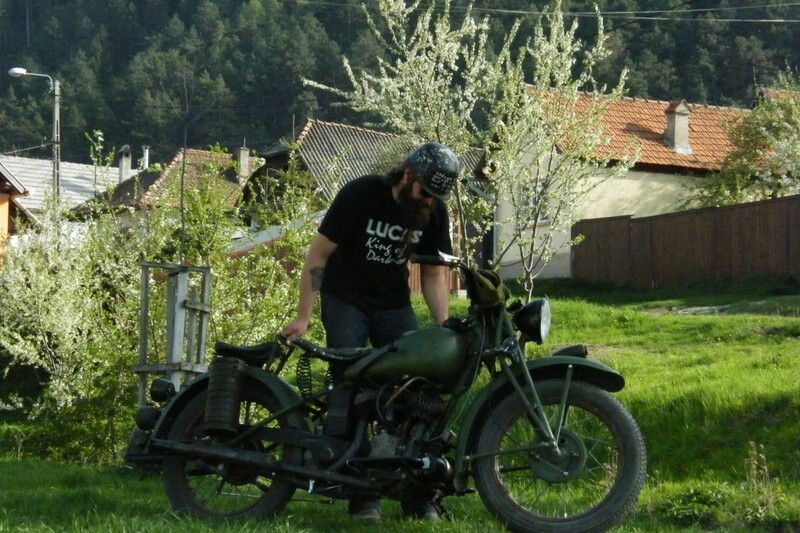 More cool stuff on Basty's blog. ...almost done; note tall-fin heads. Looks good from the other side, too. Tony's Wall of Death 101. 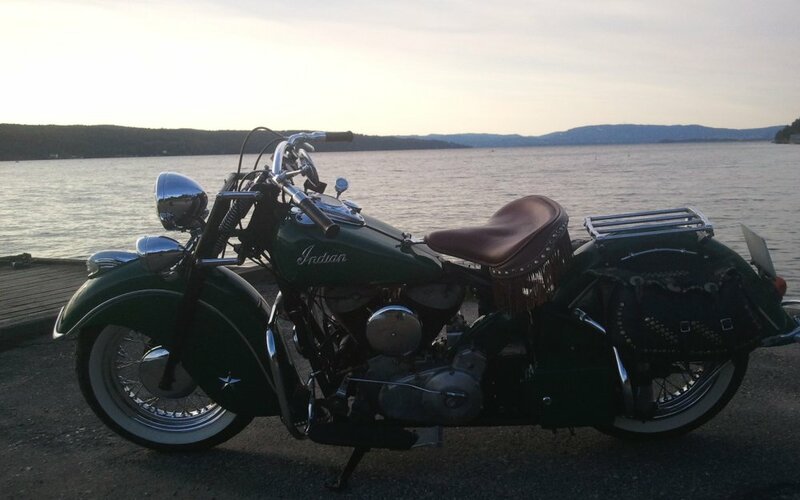 John's period modified 1939 Chief. 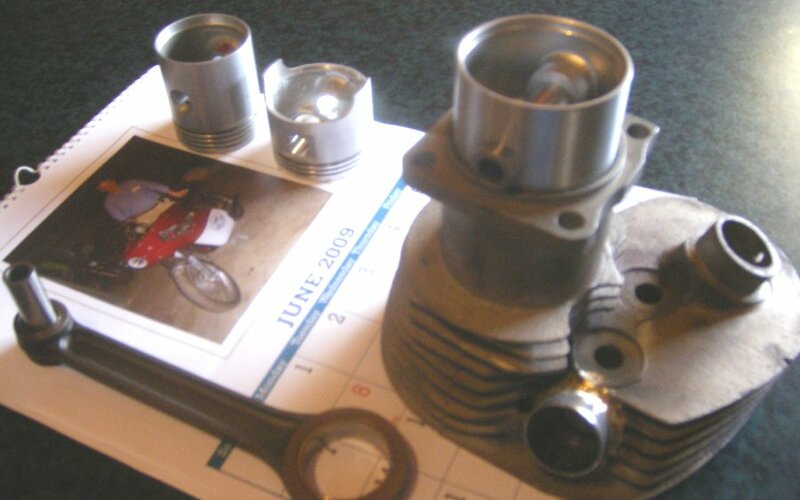 Simon's stroker engine (note pop-up). 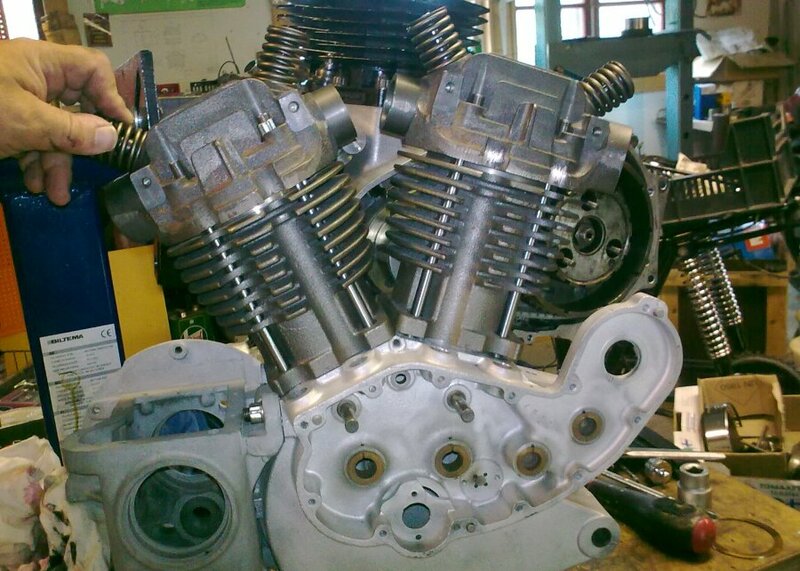 741 stroker engine in the frame. 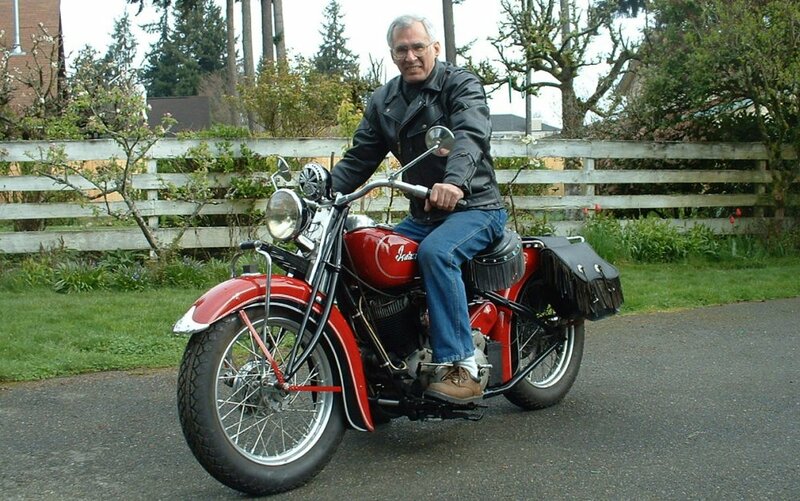 Dewey has ridden his 741 for 36 years. Steve's Vertical hybrid - on VI. Allan's 341 still going strong. 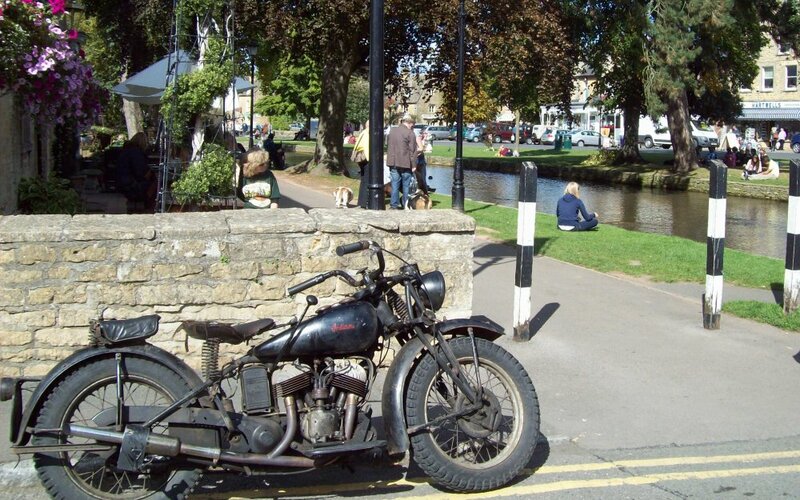 Dave's 741 on a grand day out. 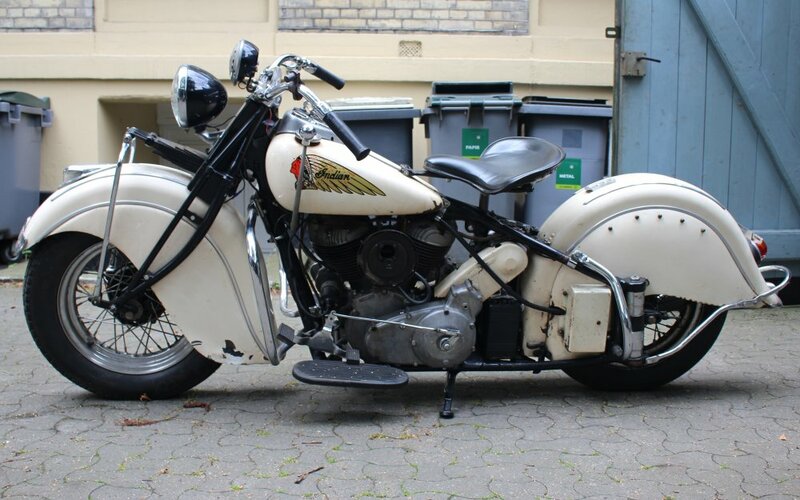 Jan's 1931 101 - other side. 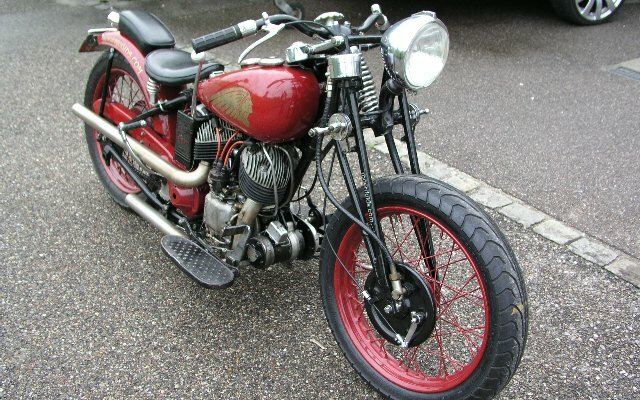 Neil's 741 - more on the VI. 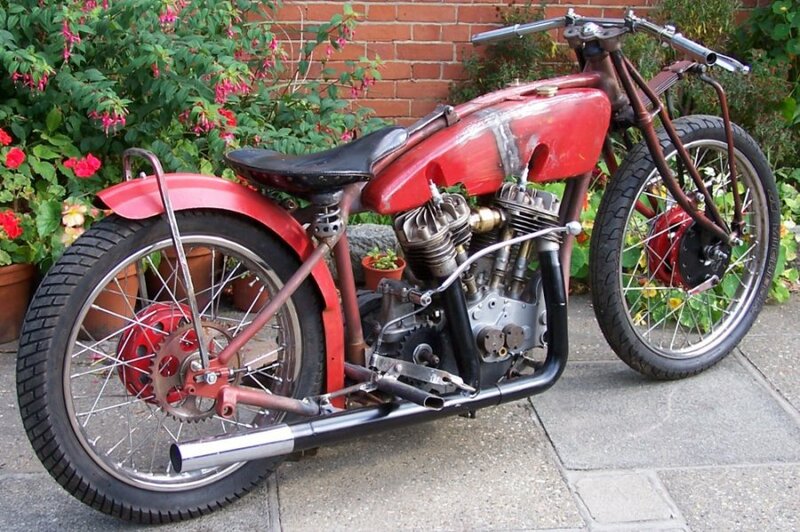 Ken's 1928 - other side. 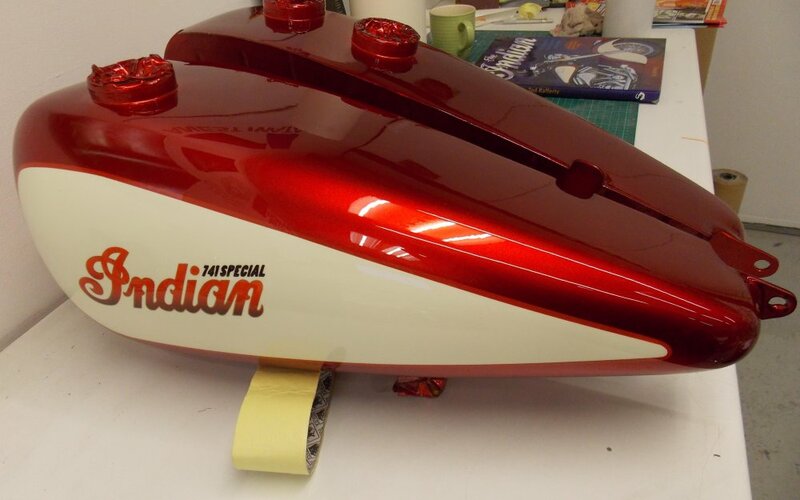 ... with its hand painted tank. Dave's 741 on a sunny day. 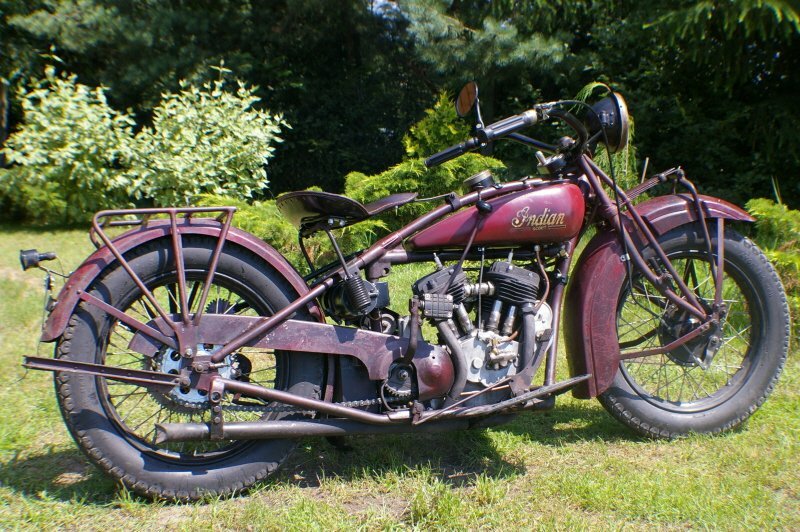 1926 Prince - other side. 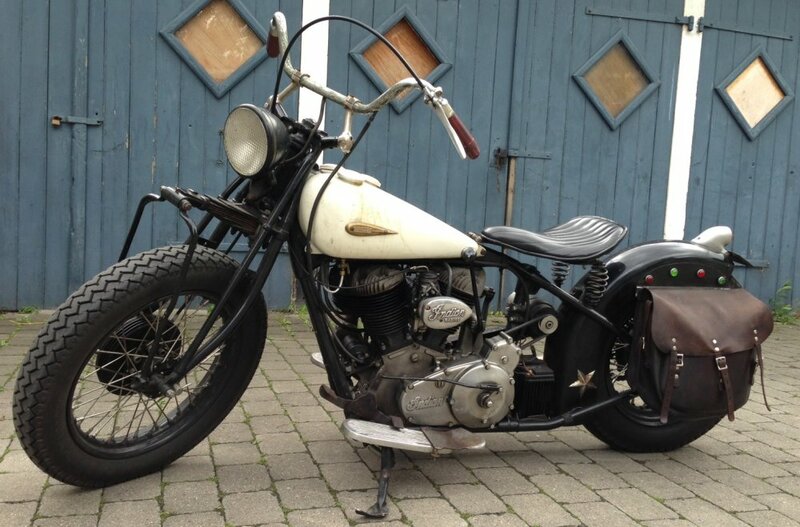 741 bobber - other side. 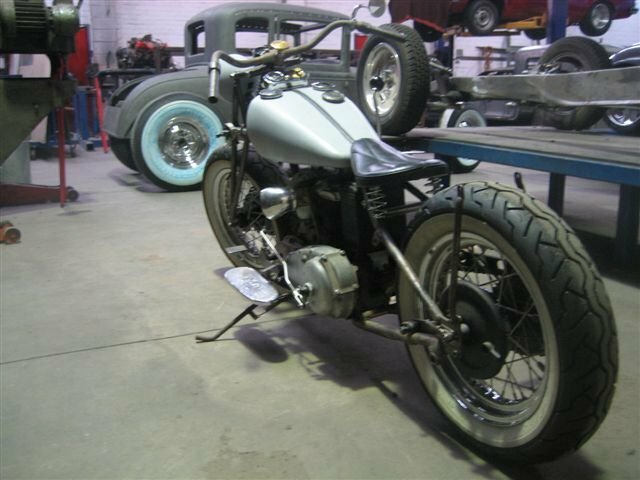 Greg's 741 bobber in Hotrod Shop. Basty making progress with 741. Getting ready for Cannonball Run. 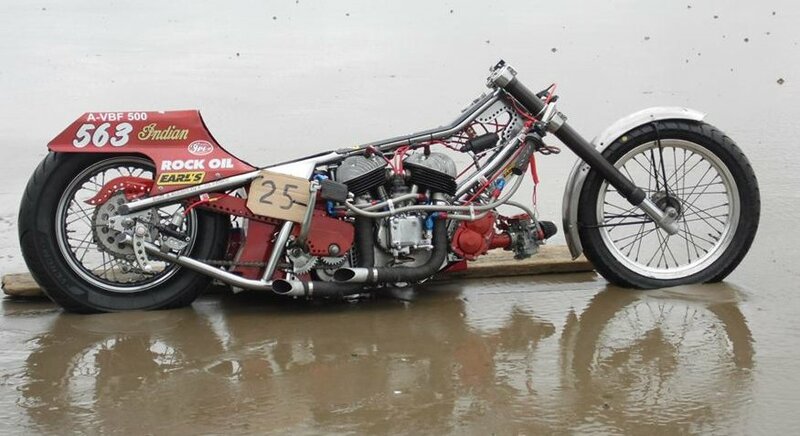 Bill's land speed racing 640. 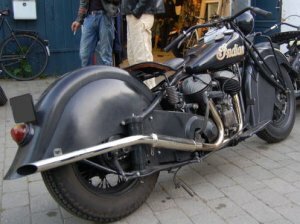 Paintjob look familiar? See below. 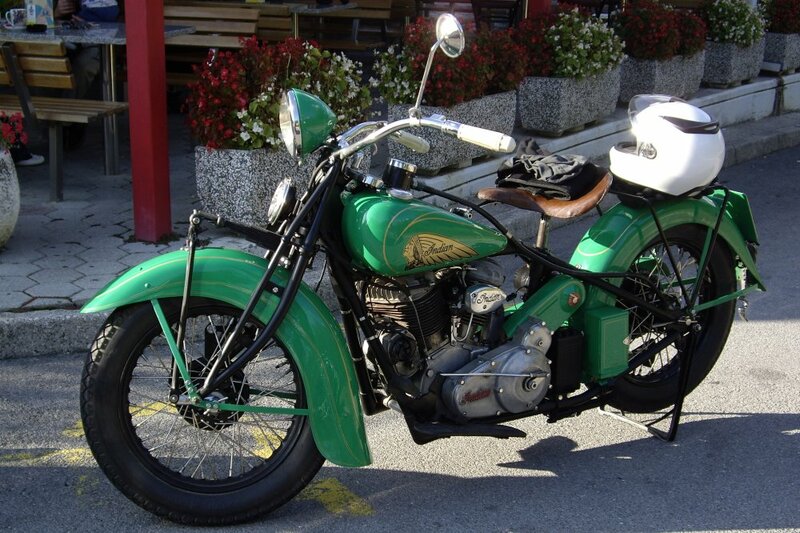 Damir's 1924 Chief with 1930 tanks. 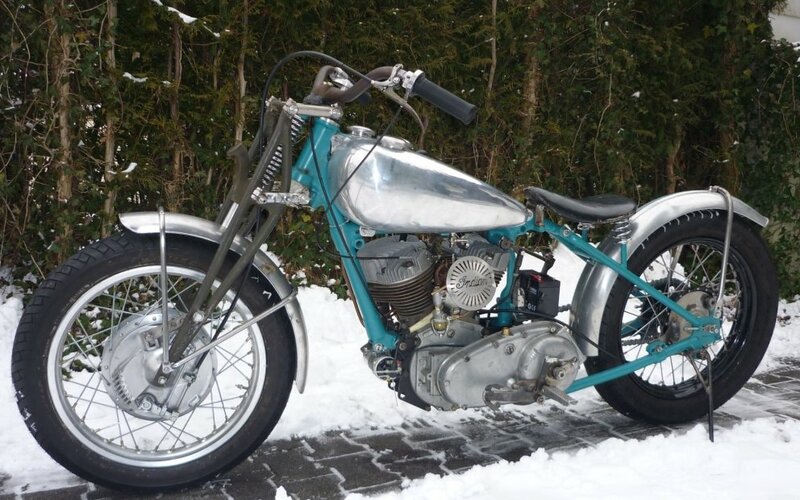 Tony's 741 DT - more on the VI. 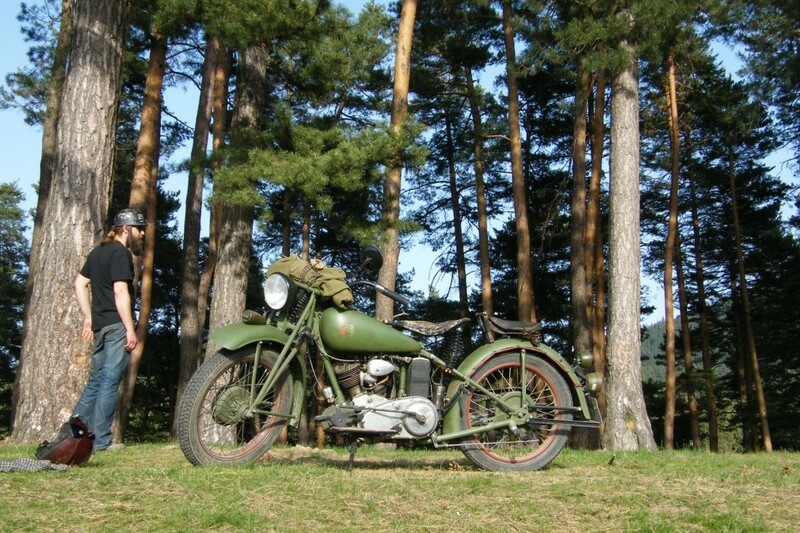 ...ride out after its ground-up rebuild. -and Rod's fine short-frame 101. 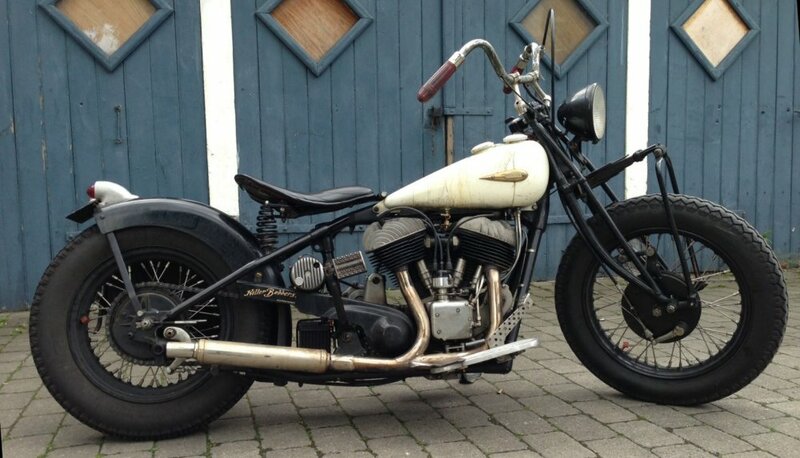 Dave's way cool bobber Chief. Stevie's 741 - warm and cozy. 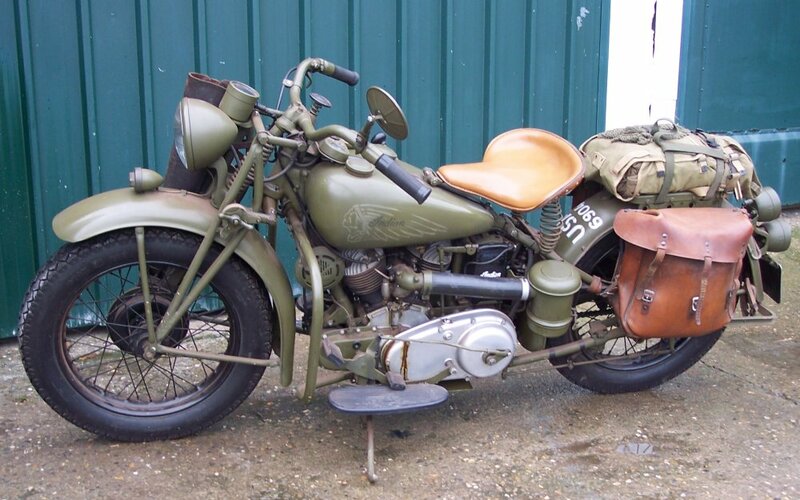 Tom's military 741 - ready to roll. ...which used to be Willard Wolfe's. 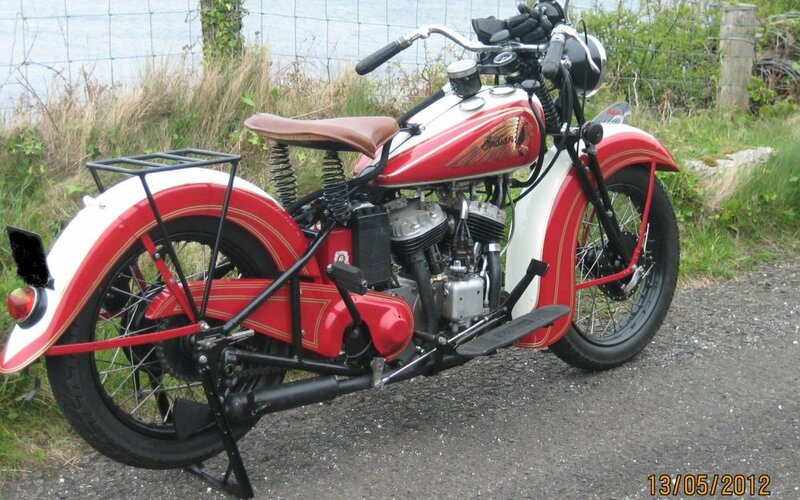 Joze's 1937 Chief - more on the VI. 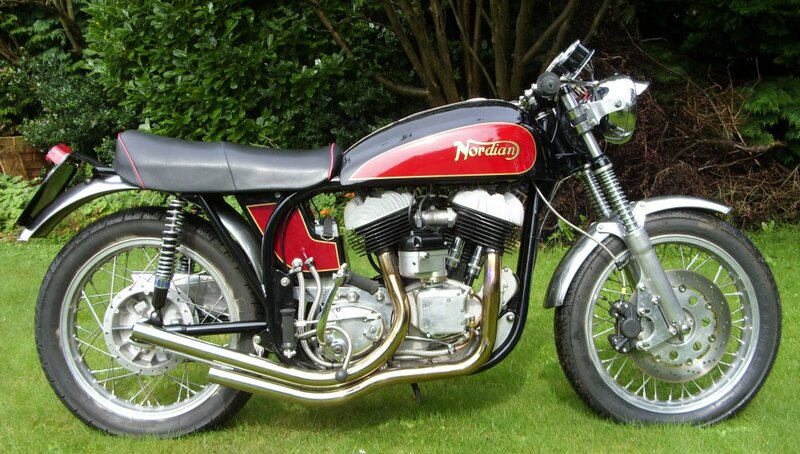 Neil's Nordian - more on the VI. Wayne's racing Chout - more here. 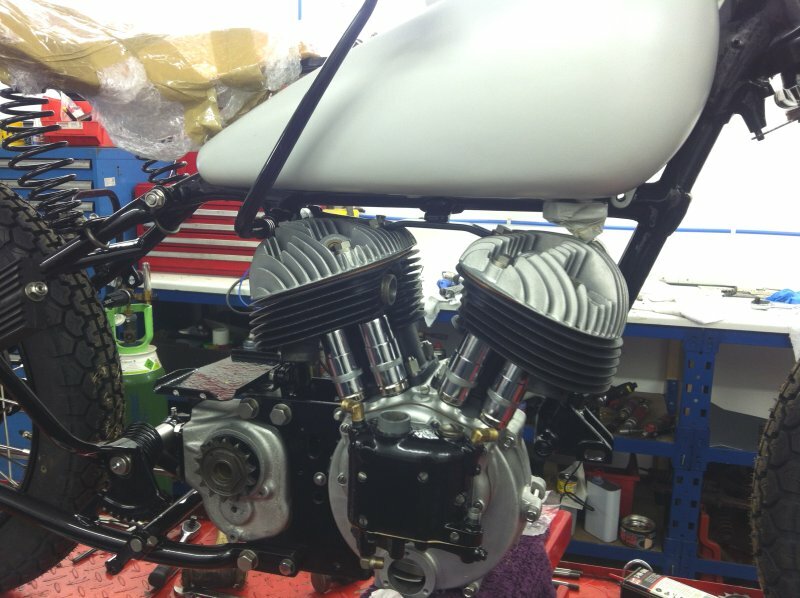 ...and the engine for Ari's project. 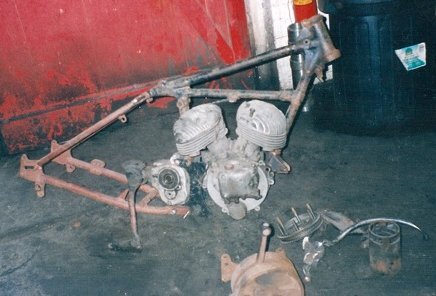 The start of Howard's stroker engine. ...and what Andy started with. 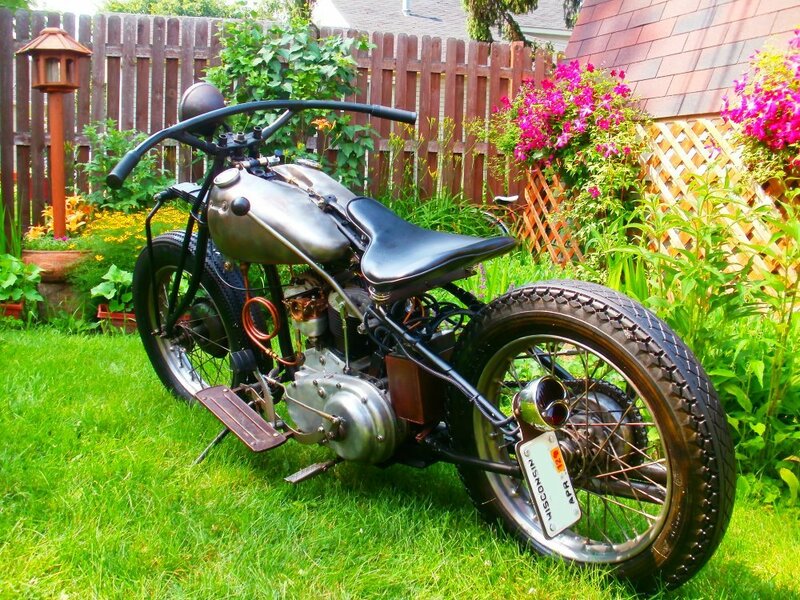 Chris' 1940 Sport Scout project. Looks good from the other side too. 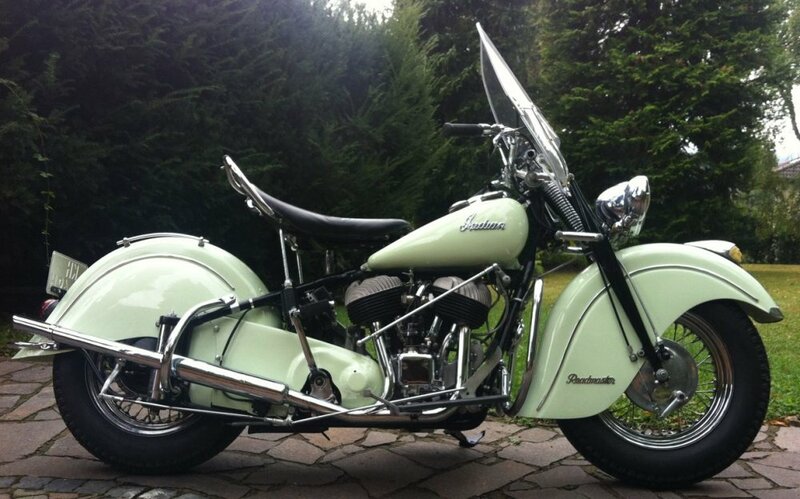 Charles' beautiful 1947 Chief. ...and what Matt started with. ...now traded in for this Chief. Here are a few Indians IPE has been involved in recently. 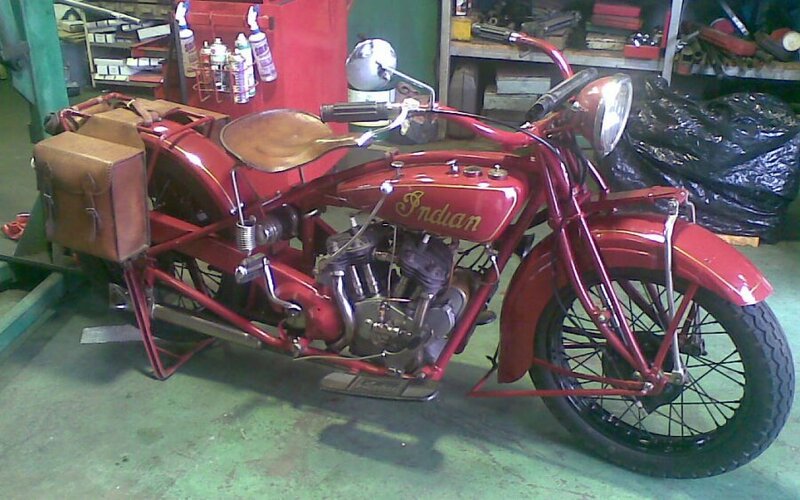 Original or restored-to-original Indians are beautiful and perfect and make your heart beat faster, but any Indian is cool no matter what. Click the photos below for brief stories on other ways of doing it. 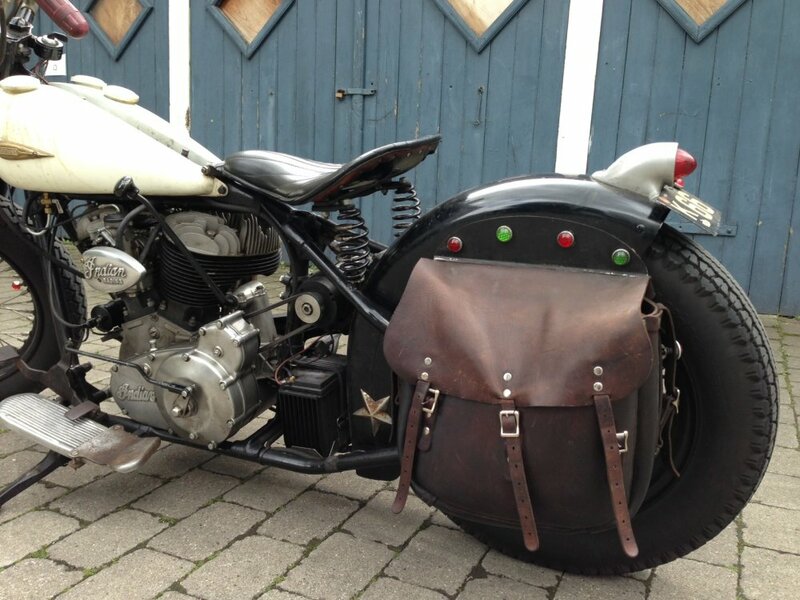 Engine and everything else by IPE. 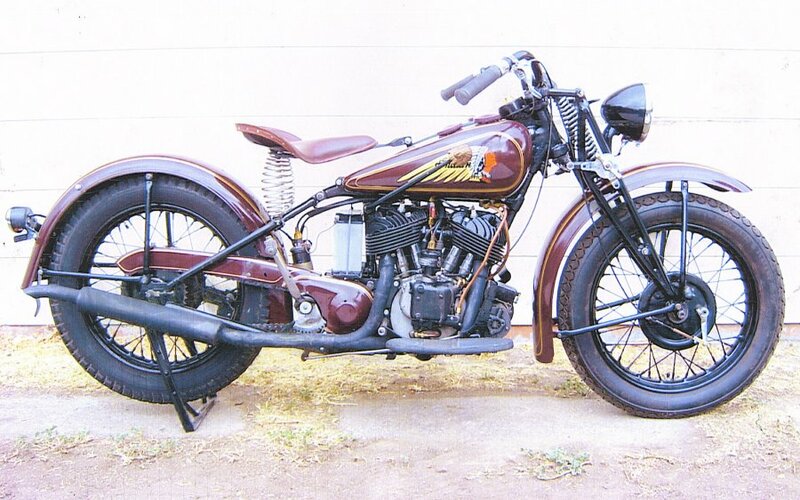 1941 Chief, 80"/1300cc. 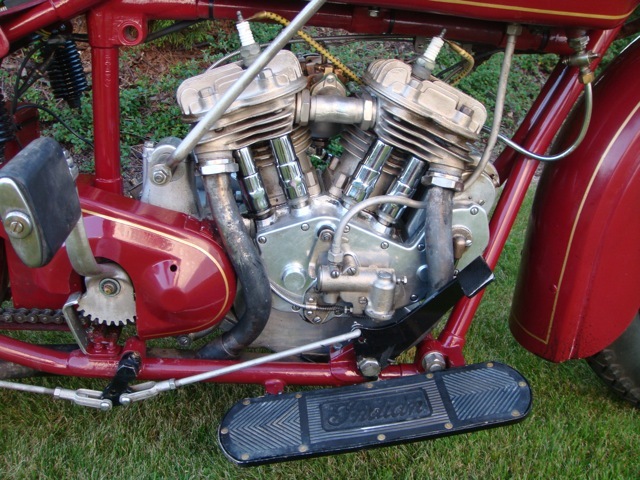 Engine and parts by IPE. 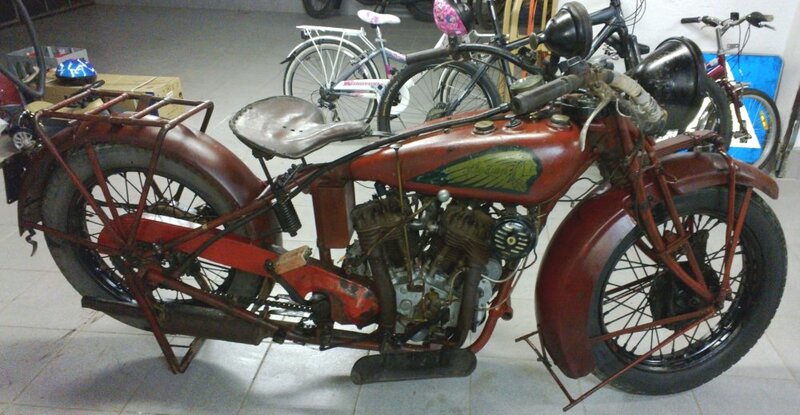 101, Older restoration barn find. Gentle resurrection by IPE. 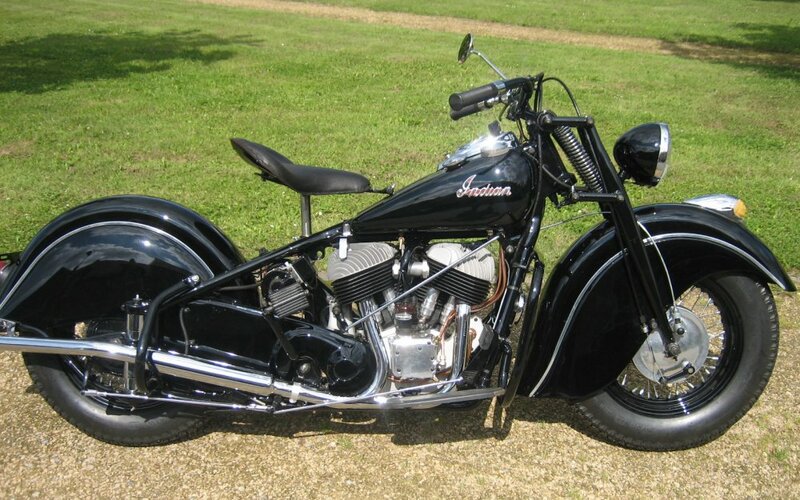 1939 Chief Bobber, 84"/1400cc engine. 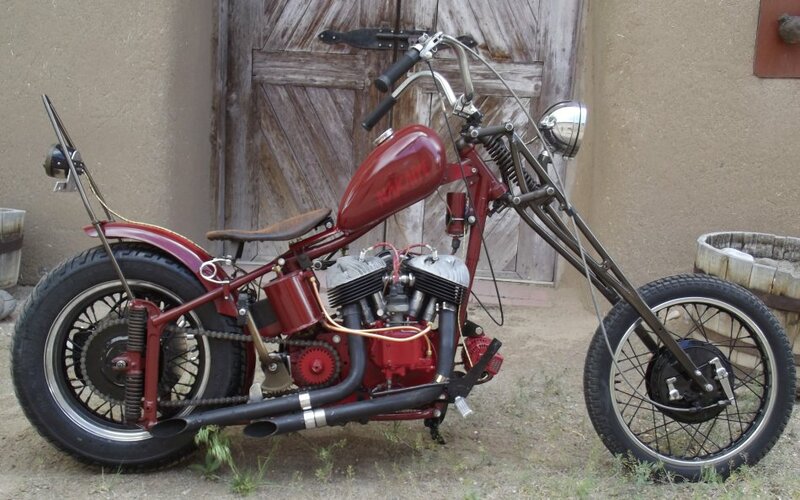 Built from all new parts by IPE. 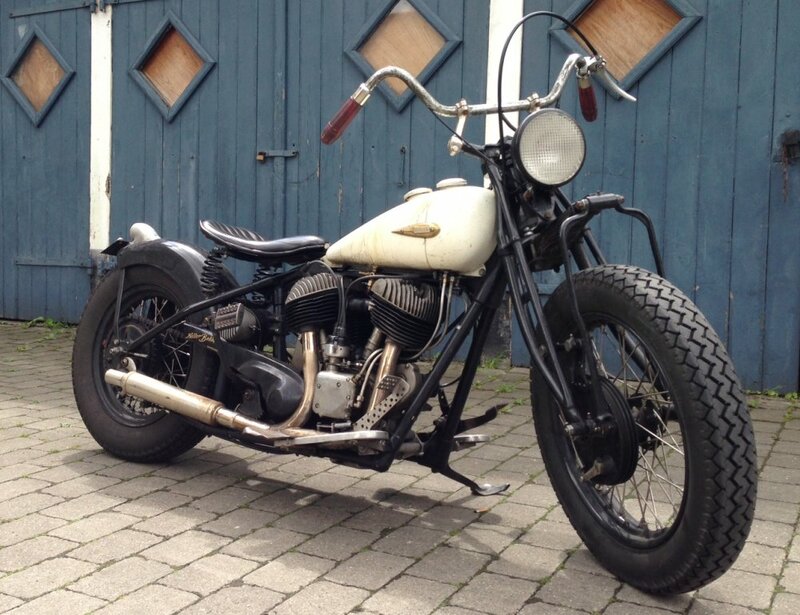 741/101 Bobber, 53"/867cc. 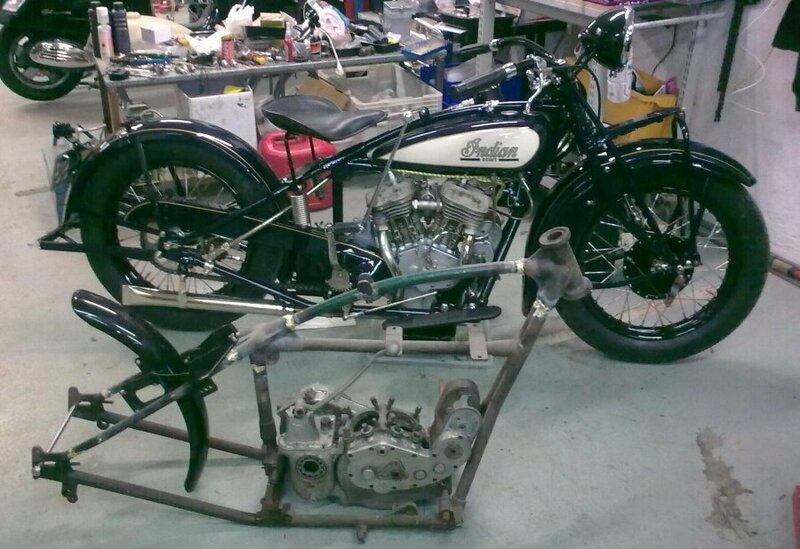 This one is now being reborn as a Land Speed Racer. 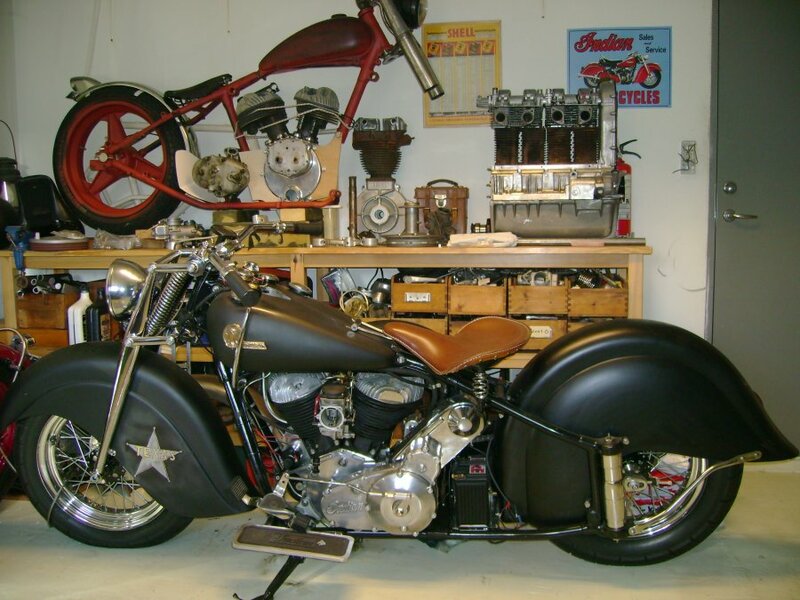 Engine and custom chassis by IPE. Chout! 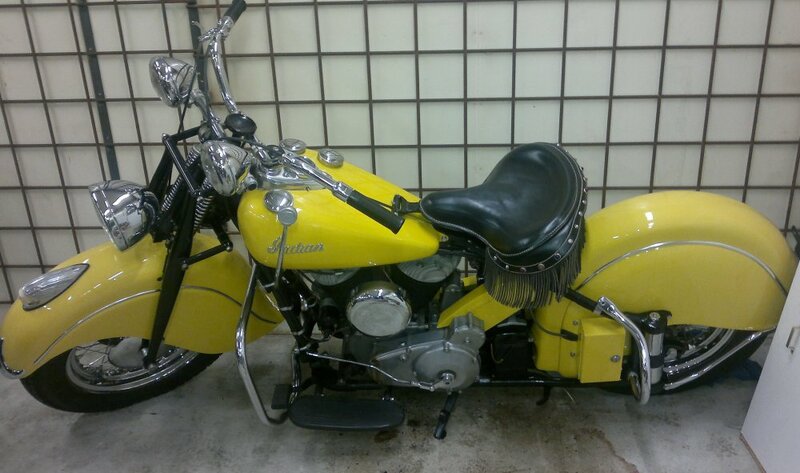 101 with 74"/1200cc Chief engine. 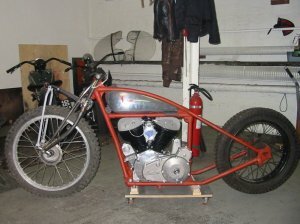 Engine and custom frame by IPE. 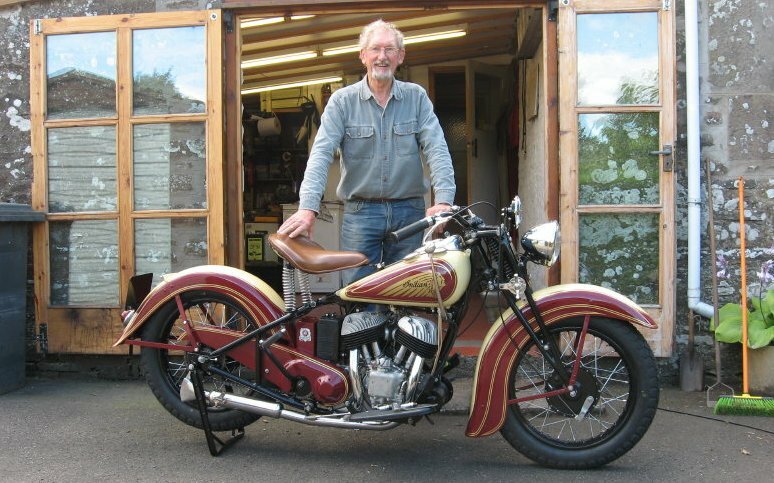 Note: IPE is mainly a mail order parts business, and generally doesn't do chassis work or complete bikes, although still taking on the occasional engine rebuild. But, while not directly business related, these little Indian stories might (apart from the hoped-for entertainment value) help provide a clue to what IPE is about. Navigation hints: Click on the logo on any page to go back to the front page (the page you are on now). Links to external sites open in a new window. Links to other pages on this site open in the existing window. Pages can be printed (useful for filling out your shopping list!). Most photos can be clicked to enlarge. Prices are in Euros and are written in red (price and mail order info here). Part numbers start with P/N and are underlined. Everything here is copyright IPE 2018. If you want to use something for a righteous and honorable purpose, just ask and it will probably be OK. I took most of the photos on this site myself, and have tried my best to give credit to the few I got from elsewhere. Let me know if I missed anything and I will fix it. 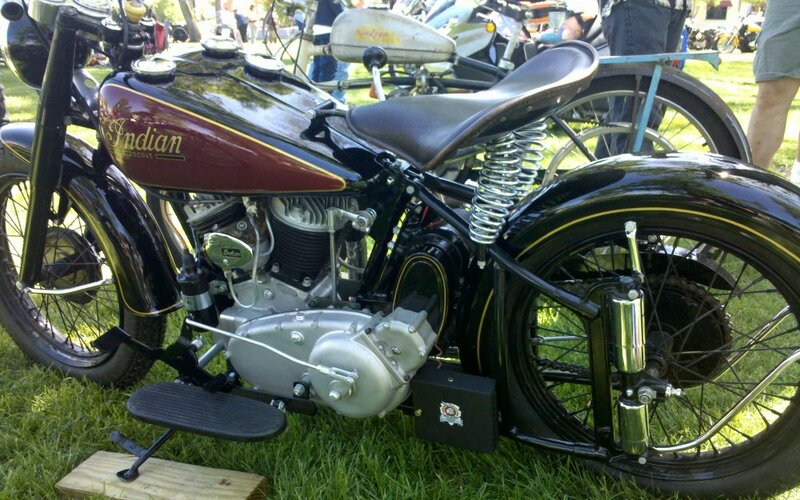 In keeping with the "sophisticated ends by simple means" spirit of Indian motorcycles, this site was made with the editor program that came free with Netscape back in last century. 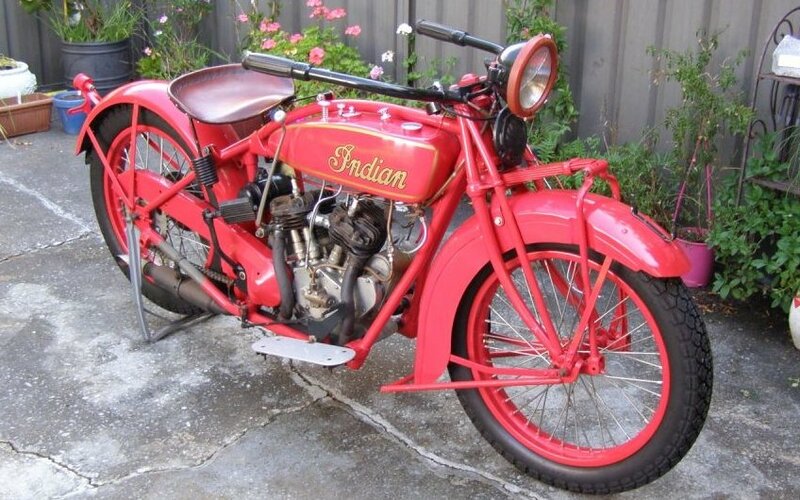 The names "Indian", "Chief", "Scout" and others are used on this site for identification purposes only. 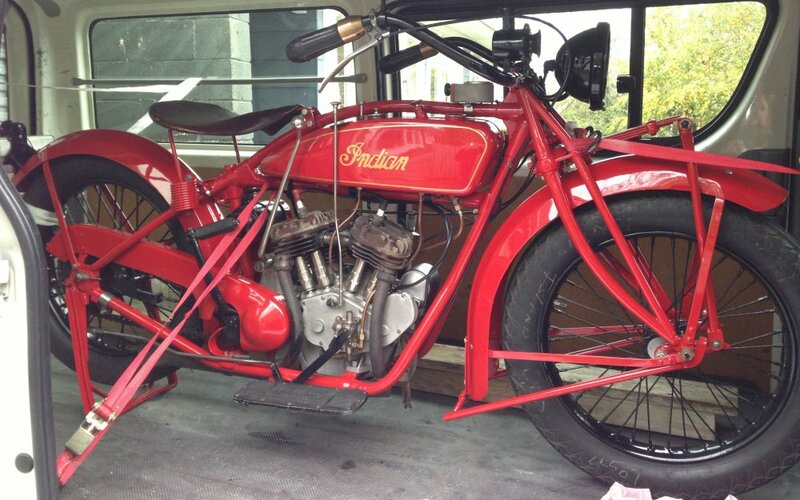 IPE is in no way associated with the new Indian Motorcycle Company. 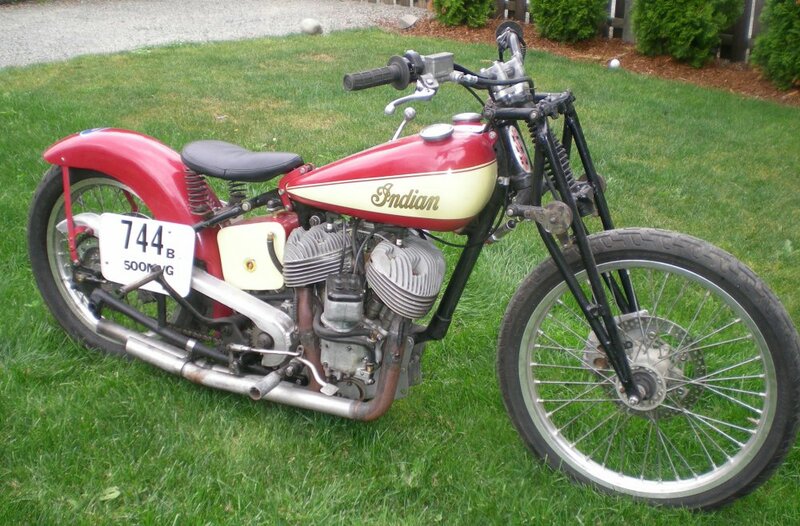 IPE only sells parts for pre-1953 Indians. For more information about the new models go here.